This week I was working on story mission XI. One of my favorite shows is Legion. I love it for its madness. Mission XI is an attempt to create my own madness in Sector Six. I am an idea generator, every day I get many ideas that could end up in Sector Six or my future games. Many of these ideas never get implemented. For example, I had an idea of laser trap, but I couldn't add it to a game because that trap was not fun to avoid. But there are ideas that not only work but work very well. The fused minion idea is one of those. So, what are fused minions? Like most good ideas, it's simple. Take minion A and minion B, cut them in half and put them together. Then give the new fused minion abilities from both of original enemies and it's done. I made three fused minions for mission XI: Heavy veteran, revenant gatherer, and havoc collector. Heavy veteran uses veteran's ballistic attacks and heavy's reflection. Revenant gatherer is gatherer with low armor, that explodes after some time. Havoc collector is worst of them! It has havoc's missile flurry and erratic mine with collector's beam attack and mines. So, yeah, I'm having a lot of fun making mission XI. It should be released soon, maybe even before April. Sector Six Release Countdown: 10! Sector Six has entered the final stage of development! I was planning to release two more story missions and then work on the last Early Access update, but decided that it will better to release them with that last update. Instead of posting traditional echoes weekly, now I will post short summaries of what I've done and update to-do list whenever I reach the next development milestone. Veteran's ballistic attack is now slower. Oesa's Radiance set effect changed, now base maximum armor is equal maximum ether. Damage bonuses now are applied to damage while Lodeon's Ultimatum set is active. Fixed and improved certain set descriptions. Shared stash in Deep Path to transfer items between player characters. Five of the Eight Machines. Rearrange achievements in the achievement interface. Increase starter ability points to 10. Increase starter part limit to 10. Decrease starter maximum ether to 50. Rework Phase Recognition system and phase properties. Rework Aggression, Resistance, and Capacity. Ability to reset controls to default. Ability to reset settings to default. Ability to toggle side mission dialogues. Lock modular difficulty system if the player level is lower than 3. Fix W. warning button tooltip offset. Virtual / physical weapon clarification / stats. Connection strength near avatar picture. Adapt backgrounds to screen shaking. Dismantle all/Uninstall all buttons should have a tooltip. Holding shift button to dismantle / sell just one item from the stack. Fix loot box stackable item glitch. Fix dialogue clash with HUD glitch. Improve shield particles and animations. Improve MDS decorative map in mission select screen. Fix Lodeon's ship glitch when skipping intro cutscene. Make Awakening Of Inner Power support all missions. Fix Guardian Of A Thousand worlds + Concentrated Fire effect timer graphical glitch. Ability to reduce the power of MDS modifiers while they are disabled. 8% of the tasks completed. I'll post again when the percentage will reach 20%. IndianaBones, RichHopefulComposer and Hyomoto like this. Money-wise it's not paying off, not yet. It was really rewarding in all other aspects. I grew up with this game, found my place in the world, gained confidence. Back in 2015 I couldn't even imagine my game on Steam, being a real game developer was a distant dream to me. Now it's very close. Just few more games, few more years. Now I know how much I can do and I can't wait to make a new game on much better foundations. If world and / or my family will not have a sudden apocalypse for a few years, nothing will stop me. Toque, Niels, Seabass (The Human) and 2 others like this. Just having a completed project under your belt is something all by itself, and I think Sector Six is a decent entry on your portfolio. I'll be watching and rooting for you. Zuurix and Viper like this. Hey, I just wanted to say I remember the very first post you made about this game (back on the old forums wasnt it?) and back then I thought "looks good, bet he never finishes it though". But here we are! You showed me lol! Anyway, I wanted you to know how inspired I have been by your commitment to the game and I think you should be proud of what you've made. You are so close to the finish line! Keep going! Xer0botXer0 and Zuurix like this. Same, seen this project come a long way. When I read sector six in the rss feed I immediately remembered what game it is. Hope you're having fun with it. Sector Six Release Countdown: 9! I have finished making mission XII! That's a pretty big achievement because mission XII was one of the larger chunks of content I needed to make and I did it in time. This update will make ability points more valuable by reducing the amount of ability points gained from level up to 1. It will also improve Aggression, Resistance, and Capacity abilities and replace Cataclysm with Breach - passive anti-shield ability! It will bring Sector Six much closer to perfection. While Guardian Of A Thousand Worlds ability is active, Concentrated Fire recharges instantly. Improved alloy containers: New property, increased sell and buy price, reduced city stock. Corrected W. warning button tooltip. Ability to decrease the level of MDS modifiers even while they are disabled. 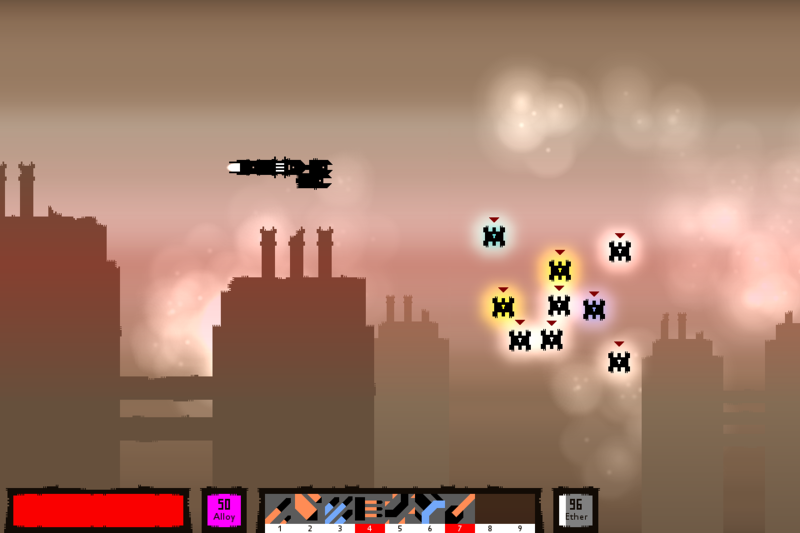 Improved missiles that appear when player's spaceship leaves the enemy range. Guardian is now more mobile. Potentially fixed Black Rain projectile + reflect chance problem. Region update flashes are now brighter. Rework Cataclysm ability into Breach ability. Improve Rapid Fire Mode ability. Dismantle all / Uninstall all buttons should have a tooltip. Character customization: Rename character and change avatar icon. 20% of the tasks completed. I'll post again when the percentage will reach 30%. IndianaBones and Xer0botXer0 like this. Sector Six Release Countdown: 8! Since the last time I have posted, Sector Six has become a much better game! In a chain of small changes, I have made ability points more rewarding, ability scaling more important, six least useful abilities more useful, leveling more consistent, and phase mechanic more effective! Phase mechanic now used to turn enemy damage into player damage. 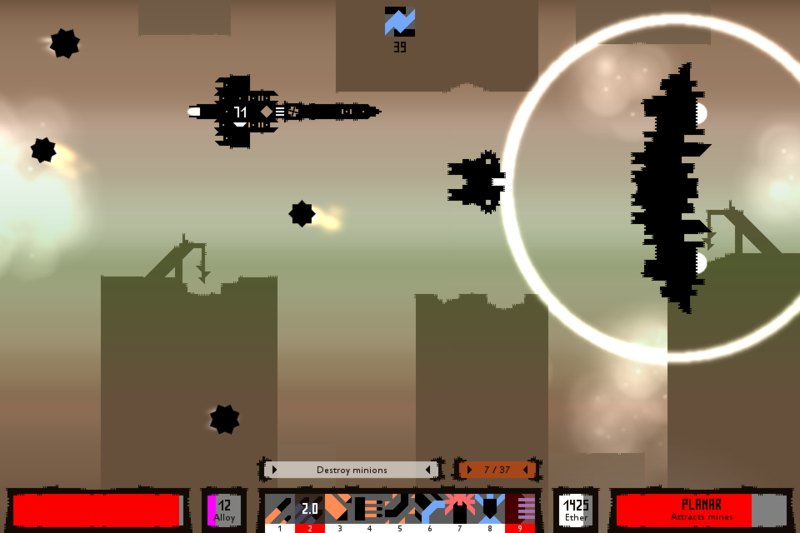 After X amount of damage taken, player's spaceship will enter phase which will increase damage by Y% for 5 seconds. I have also added mission XIII. It's more or less a big cutscene, but with it done, I can focus on the main features of the final Early Access update. So, yeah, tomorrow I'm starting to work on relics! The arrival of relics will finally end the dark ages for Sector Six and it will become a true loot game! Fixed story mission X glitch. Reworked phase break mechanic: Gain additional damage after taking a certain amount of damage. Channel ability’s ether cost reducing effect now lasts 3 seconds, making Channel much easier to use. Cataclysm ability has been replaced with passive anti-shield ability: Breach. Renamed Phase to Phasse, to differentiate it from phase mechanic. Improved Aggression, Resistance, and Capacity: More powerful, interesting, and consistent with other abilities. Decreased starter part limit to 6. Decreased starter maximum ether to 50. Starter engine now gives less maximum armor. Increased starter ability points to 10. Potentially fixed Black Rain projectile problem. Level cap changes and game options. Virtual and physical weapon clarification and stats. Dismantle all and uninstall all buttons should have a tooltip. Holding shift button to dismantle and sell just one item from the stack. 32% of the tasks completed. I'll post again when the percentage will reach 40%. Sector Six Release Countdown: 7! This and previous week, I've been improving Sector Six loot. I have made many changes to random part generation system, made higher grade parts more common, added 22 part properties, gave parts more interesting names, but most importantly – I have implemented relic system and first 7 relics! Relics not only are the rarest and the most powerful items in the game - they also have unique effects, skins, and even animations! I would have made a video about relics, but I didn't have enough time for that, so instead scroll down for screenshots. With relics implemented, now I will work on the last story mission and several small changes. 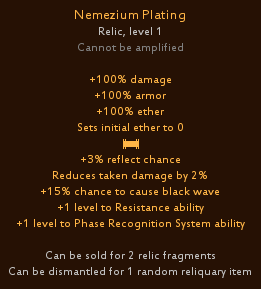 After rarity changes, relics are now rarest items in the game, their drop chance is 1 in 500. Relics can be sold for 2 relic fragments. 8 relic fragments turn into a relic. Relics give reliquary items instead of alloy when dismantled. Reliquary items re-roll and transform relics. 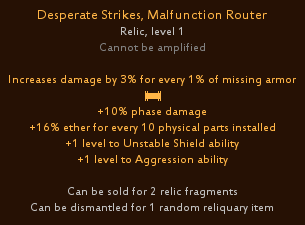 Relics can have up to 7 properties, but cannot be amplified. Relics are always level 1 and have properties that are useful no matter what level you are. You cannot install more than 3 relics. Yet. You cannot install relic duplicates. E.g. : You can't have two Quasar Domes installed. 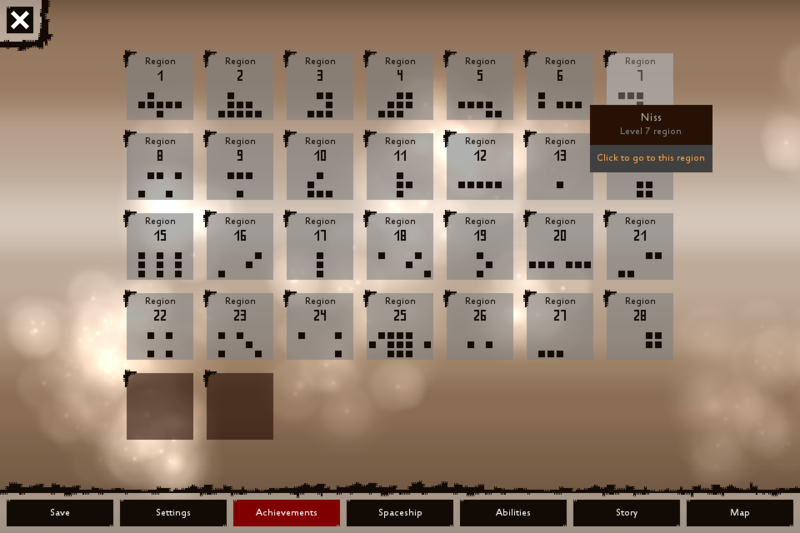 7 relics are implemented, I will implement at least 10 more before game launches. Rebalanced ability points: +1 ability point per level. Higher grade parts are now more common. Parts give less damage reduction and reflect chance. Parts give fewer wave chances. Improved item generator: Now produces more random items. 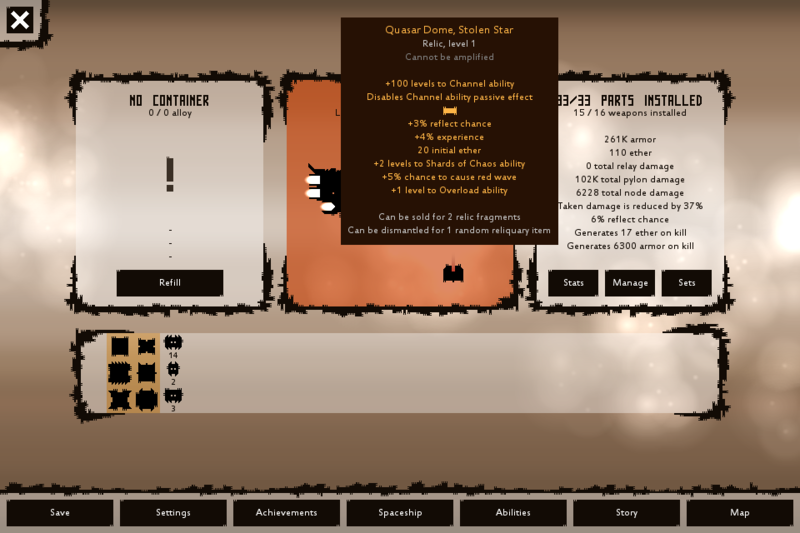 Item changes: Changed diode cost, changed certain item sprites, improved item use error messages, improved tooltips. Shared stash in secured regions. 40% of the tasks completed. I'll post again when the percentage will reach 50%. I can't believe I haven't noticed this yet! It looks beautiful and genuinely fun to play, looking forward to it's release. I can guarantee at least 10 dollars, but you will obviously make much more than that! Sector Six: Two years on Steam! On this day, 2 years ago, Sector Six was released on Steam and I'm giving away a few keys on SteamGifts and Steam group! I would do something bigger for this special day, but I'm really busy preparing the game for the final release. Seabass (The Human) likes this. 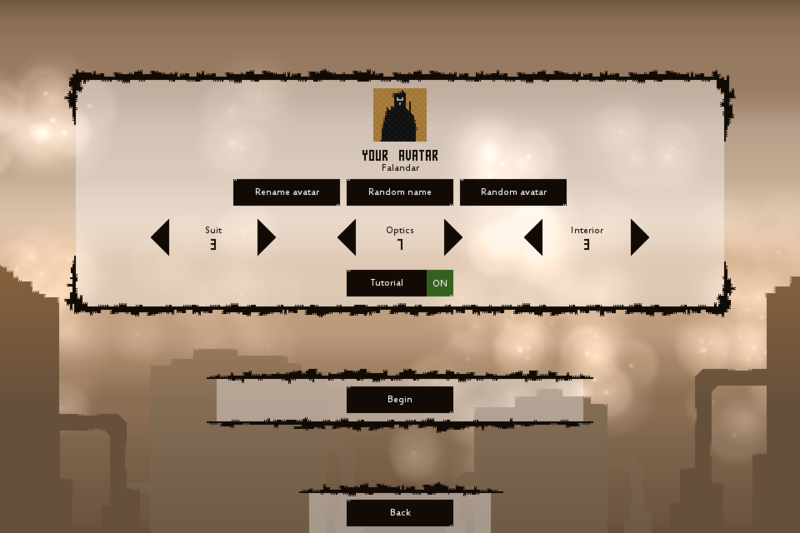 @Hyomoto New feedback, new ideas, new suggestions, and the new HUD is born! Sector Six Release Countdown: 6! Since the last time I posted, I've been working on inventory improvements, mission XIV, ability scaling, new HUD, and other things. Long story short, mission XIV is getting closer to being finished, meanwhile many parts of the game have become easier and better to use. Now I would be directing all my attention to mission XIV, but this week I have received a lot of new feedback and now I have to make a few important decisions. I might choose to do some really big changes to the game, which would delay the release by a month. If that happens, I will make another post explaining the situation. Anyway, to the task list! Toggle XP gain feature has been removed. Improved item management and filtering. Parts give less wave chances. Reworked phase break mechanic: Gain additional damage after taking certain amount of damage. Improved Aggression, Resistance, and Capacity: More powerful, more interesting, and consistent with other abilities. 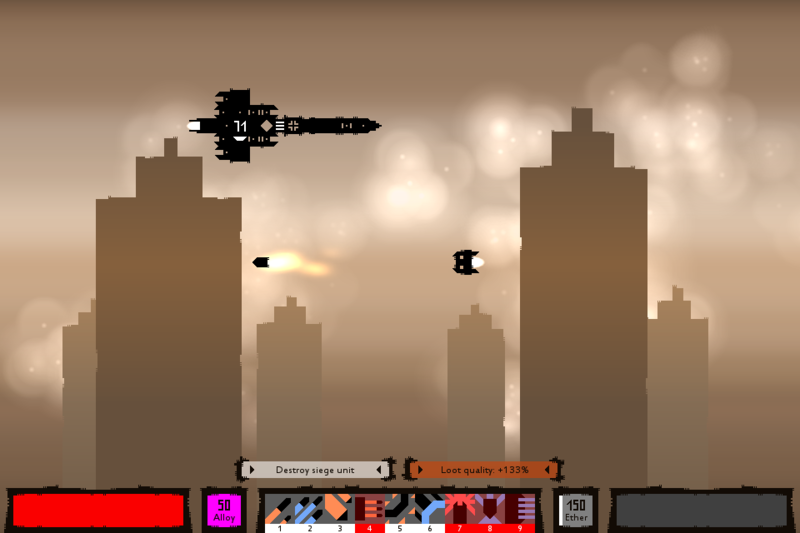 Improved missiles that appear when player's spaceship leaves enemy range. Sector map interface and map tutorial. Improve tutorial and class select. 50% of the tasks completed. I'll post again when the percentage will reach 60%. Hyomoto and IndianaBones like this. In "Sector Six Release Countdown: 6!" I have said that I was considering to do some big changes to Sector Six. Now I have decided to do them, and this is an update on that, as promised. First, spaceship classes are not going to be a thing anymore. All abilities will use the same damage type. 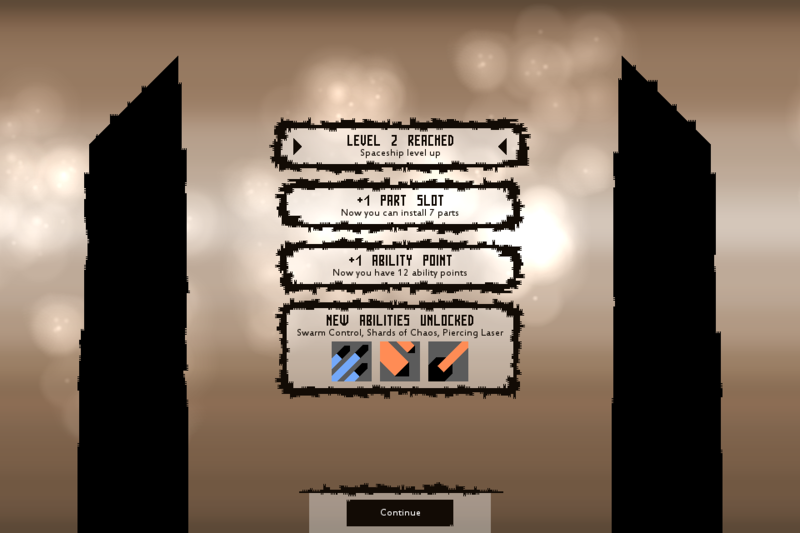 Secondly, abilities will be unlocked with level. You'll start with three basic abilities and unlock other abilities on level up until you reach level 30. Finally, because weapon damage is now universal to all abilities, weapons will now reduce cooldown and maybe even ether cost of certain abilities. Why am I doing these changes? Because they will make the game much better both for low-level and high-level players. New players won't have to deal with 36 abilities, weapons will be more interesting, leveling up will be more impactful than ever, there will be more important decisions to make, and so on! The catch is that it will take a week or more to do all those changes so the final Early Access update will be slightly delayed. Hope this sounds good, I will post again when I'll catch up to countdown or when there will be more changes in plans. It's been a week since I made the last post, so here's an update on what I'm working on. Two days ago I have successfully merged classes and made abilities unlock when leveling up. Yesterday I have started working on weapon rework. Since abilities use the same damage type now, all weapons are the same and that is not good. To combat this, I have made weapons reduce ether and cooldown of abilities. I have doubled ether costs and cooldowns of most abilities. Installing right weapons would reduce ether costs and cooldowns to their normal values. It did make weapons more interesting than ever, but it was a little too messy. Just replacing one installed ability with other, would require the player to hunt for a different set of weapons. Plus, it didn't create any interesting decisions. It feels like punishment for not installing right weapons and it's not what I want. So, I am going revert all yesterday's progress and start working on the new idea. 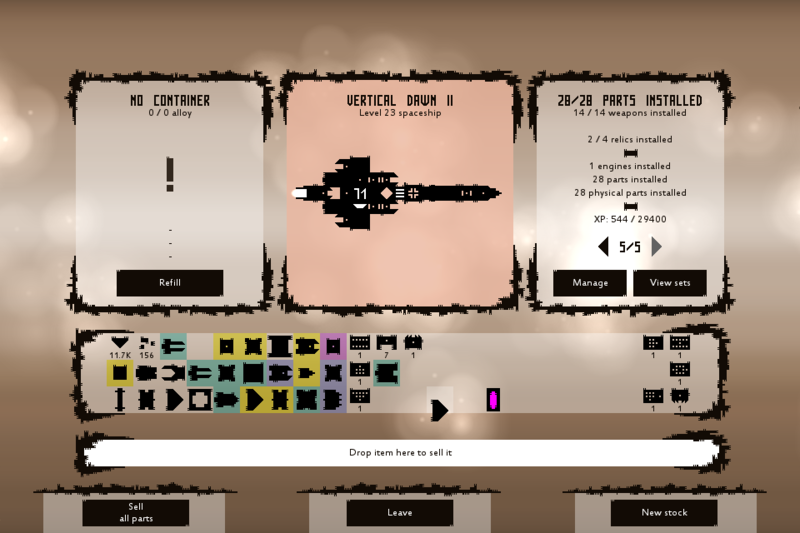 The new idea is to make weapons work in a way that allows the player to build three different spaceships. 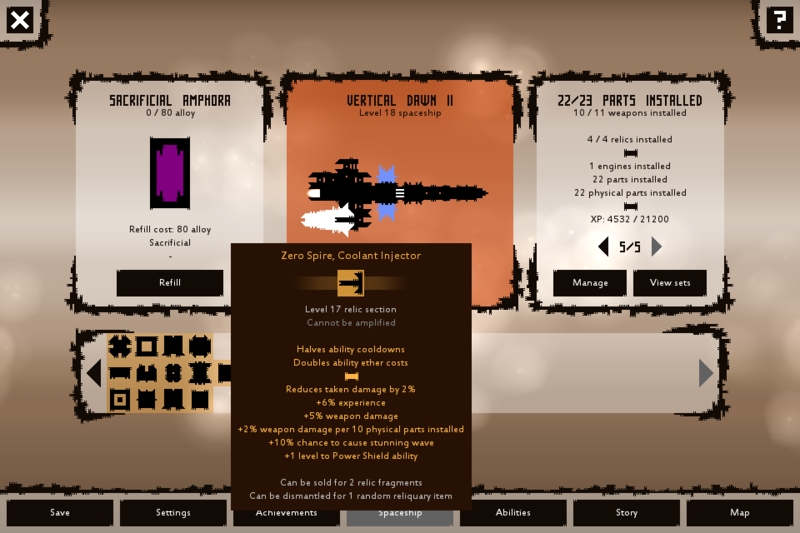 - Powerful spaceships that have higher damage, longer cooldowns, and burn more ether. 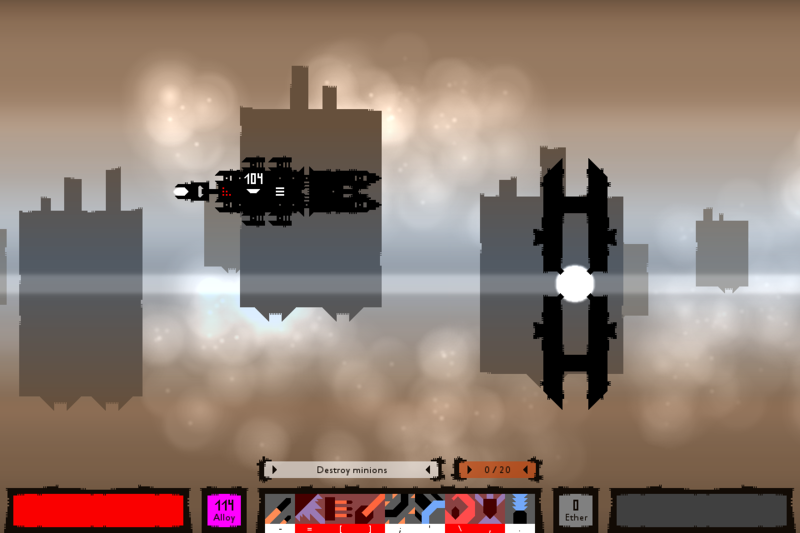 - Fast spaceships that have shorter cooldowns, lower damage, and burn more ether. 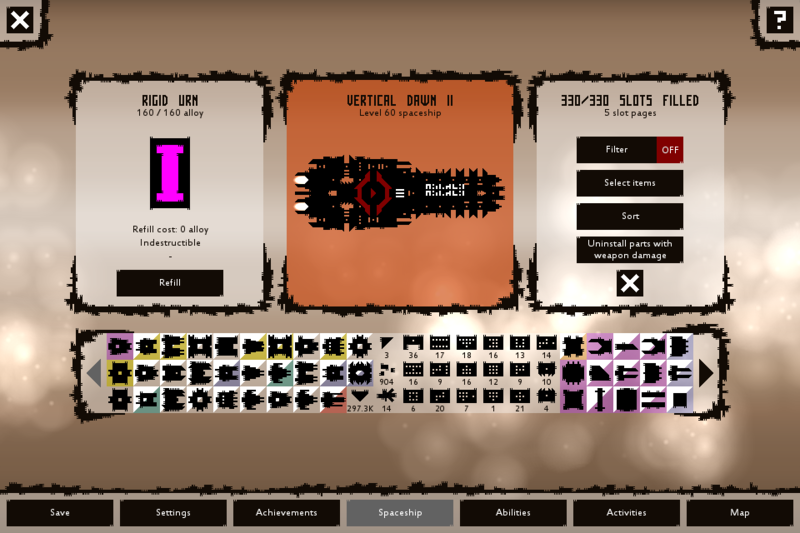 - Efficient spaceships that have longer cooldowns, lower damage, but burn less ether. To make it happen, weapons will get two new properties - ability ether cost reduction and ability cooldown reduction. To stop these properties from making abilities too fast or not expensive enough, they will not interact with ability ether costs and cooldowns directly. Instead, the player will need to install a certain amount of weapons to reduce ether costs or cooldowns of abilities by 25%. If requirements are not met, abilities will have base stats or even become 25% more expensive and/or slower. Requirements will rise with the number of parts installed. Basically, there will be three types of weapons and by focusing on one weapon type will allow the player to make spaceship powerful or fast or efficient. What's also good about this system is that it doesn't really end with three spaceship types. It will also be possible to make spaceship excel at more than one field - maybe even at all three with enough rare, amplified weapons. As for the final Early Access update, I'm still over a month away from releasing it. This rework created a huge delay, but I think that it's worth it because the game will become a lot better. Next week I'm hoping to continue the release countdown, so until then! I just picked up your game on the steam sale. I have to say that I really like it, and think it's very polished! My only complaint right now is that I can't remap abilities to mouse buttons. I didn't like having to go from mouse to straight keyboard back and forth for different things. I was using the carrier and it would of been great to have the movement as wasd, with the abilites and other buttons right there, then have the mouse for launch mines and detonate. The controls feel a little clunky without that feature, and it also feels like my hands have to jump around the keyboard a lot. I'll consider making it mouse controls possible. Sector Six Release Countdown: 5! Since the last time I posted, I have finished weapon and ether reworks! 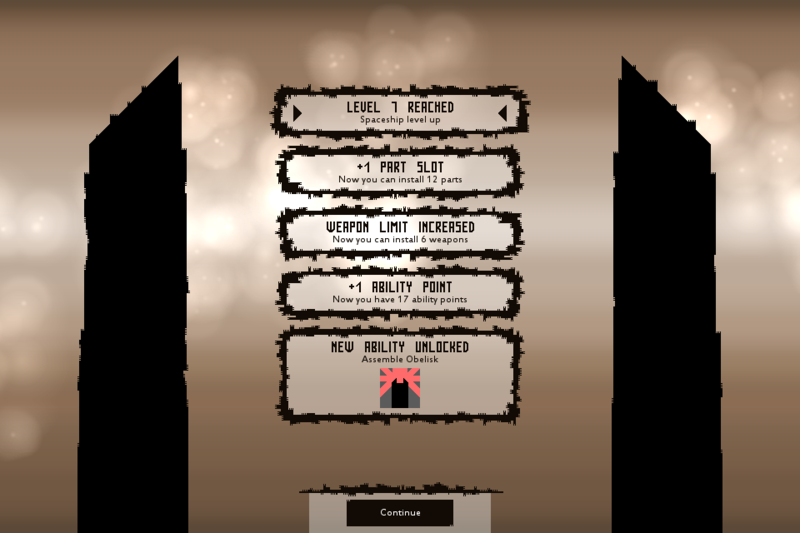 Weapons now modify ability stats and ability ether costs increase with level. These changes have significantly improved quality of loot and variety of possible spaceships. 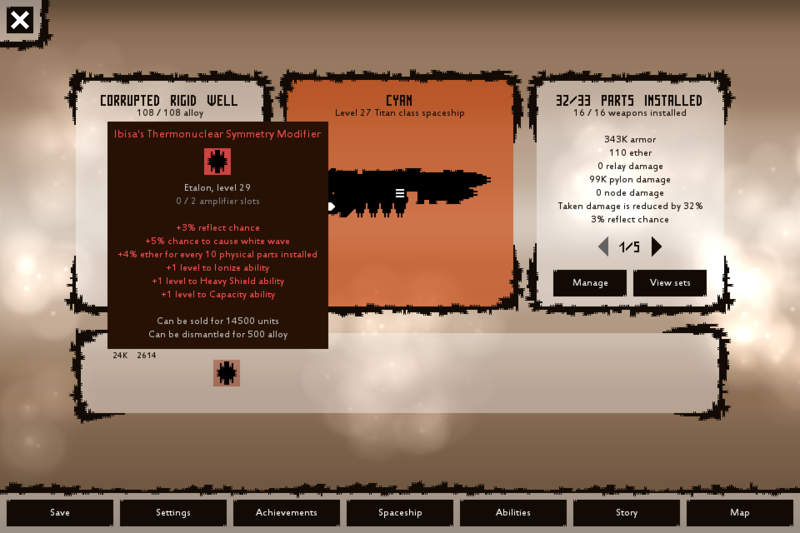 There are three weapon stats now: Weapon damage, cooling rate, and ether efficiency. Relays increase weapon damage, which increases ability damage. Pylons increase cooling rate, which reduces ability cooldowns. Nodes increase ether efficiency, which reduces ability ether costs. It's possible to focus on one weapon stat to make spaceship deal a lot of damage or have low ability ether costs or have low ability cooldowns. For example, during testing, I have built myself a spaceship that reduced cooldowns of its abilities by 94%! While it dealt very low damage, powerful abilities like Shards of Chaos, Swarm Control, and Entropic Missile had really low cooldowns, so I was able to spam them and it compensated the lack of damage. It was really fun, and I can't wait to see what you guys can do with this new system. As for ether rework, it made each ability point spent increase ether costs of all abilities by 10%. This allowed me to make part ether properties scale with level, so now parts that increase ether are more rewarding than ever! Now I will be working on making tutorial and introduction shorter and better, which should take about a week. After that, I will work on story mission XIV. ETA is back to 50 days, because I have added new things to the list and because there were all those reworks that created a huge delay. Let's hope my calculations will be wrong again, but this time to our favor! Ether rework: Ether properties now scale with level, ability ether costs increase with ability levels. Weapon rework: Nodes now reduce ability ether costs and pylons reduce ability cooldowns. 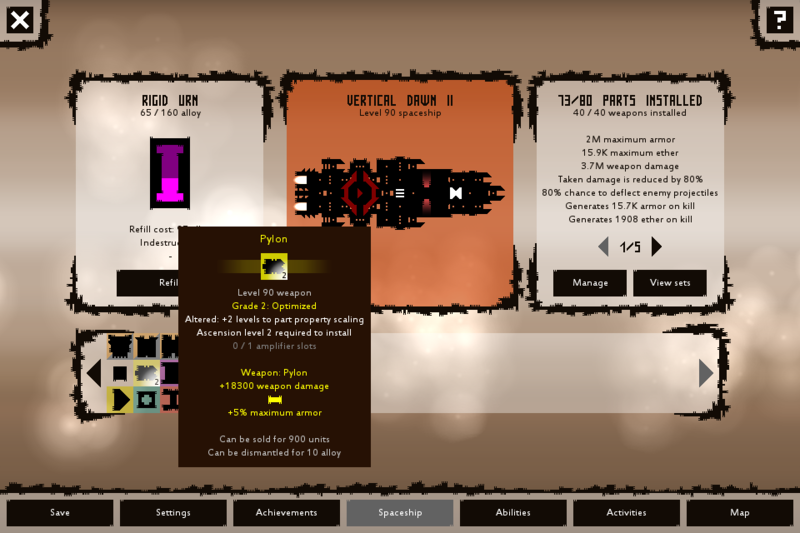 Ability rework: Abilities now use same damage type and are unlocked as spaceship level increases. Rebalanced ability points: 1 ability point per level. Adapted backgrounds to screen shaking. Added button that resets settings to default. Added button that resets controls to default. Modular difficulty system changes: Flow Stagnation maximum level changed to 1, rebalanced rewards. Reworked Creation of Energy and Channel abilities. Heavy Shield rework: Now called Power Shield, no longer slows down spaceship. Improved ability and effect icons. Oesa's Radiance set effect changed, now base maximum armor is equal to maximum ether. Sector map interface and map key. Rework tutorial and class select screen. 60% of the tasks completed. I’ll post again when the percentage will reach 70%. Sector Six Release Countdown: 4! The most important of those is, of course, loot rework! It's very simple - making missions more difficult will make enemies drop more and better parts. Additionally, drop quality is now influenced by minion power and whether it is modified or not. For example, modified dreadnought will drop better parts than the normal dreadnought and normal dreadnought will drop better parts than a tank. There are still a lot of random chances involved, so don't expect this to be true all the time. 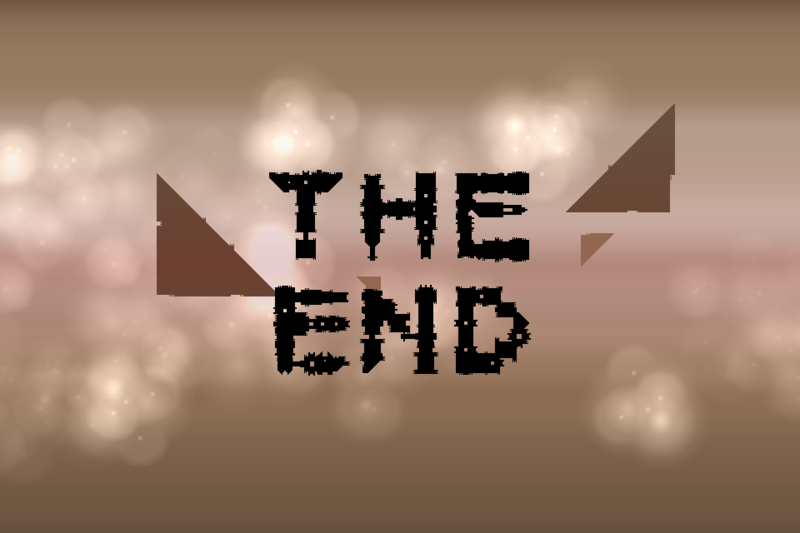 Introduction cutscene has been removed, because it was too long and, well, not that good. Instead of it, there are several dialogue boxes that appear before and after the tutorial. The tutorial has been shortened as well, so it takes a lot less time to get to the real game. Region select screen allows to quickly jump from one region to the other, without using arrow buttons. This is useful to higher level players and it will be even more useful when the Restoration War activity will be added. Finally, now it's possible to create a custom character for dialogues. You can change character's name and dialogue appearance. I'm really happy with the improvements, but not that happy with how fast I've been working. Unfortunately, ETA has not moved forward much. Now it's at 45 days. This is because there were several delays and because loot rework was not included in the previous ETA. This weekend I won't be at home, so that's another delay, but when I'm back, I'll be working on the final story mission and the Machines. My current estimate is that it'll take 3 weeks, but if I can do it faster, this will bring the release much closer. Currently, story mission XIV and the Machines are the biggest tasks on the list. 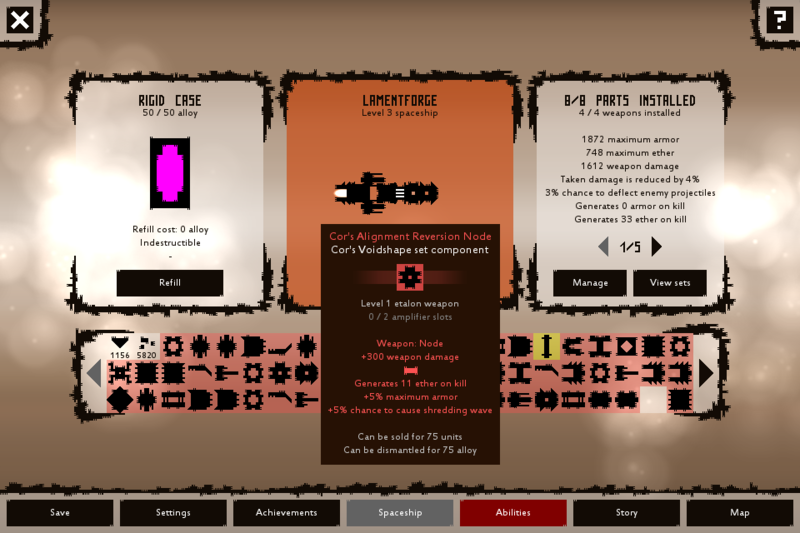 Loot rework: Bigger enemies now drop better parts, difficulty level makes enemies drop better parts. Added region select screen and map key. Added avatar customization: Name your character and choose how it looks in dialogues. Reworked Super Shield ability: Shield lasts 8 seconds and increases armor generated on kill while active. 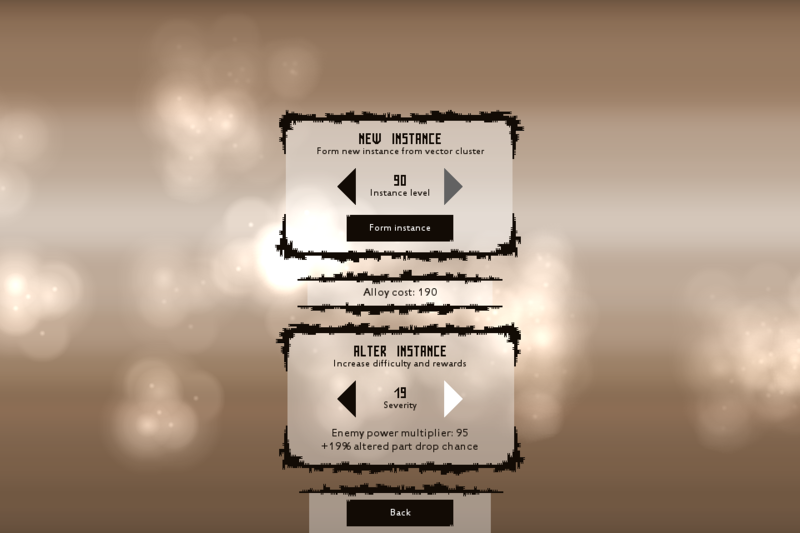 Modular difficulty system changes: Flow Stagnation maximum level changed to 1, rebalanced rewards, removed diodes. 70% of the tasks completed. I’ll post again when the percentage will reach 80%. I was just thinking about this today and yesterday... you were due for another countdown. I look forward to playing it again once you're finished with the game. I still feel like you need prettier background colors in game to make it look more lively. Sector Six Release Countdown: 3! Sector Six story is completed! I admit that I wanted too much from it. 14 different missions, 8 bosses, choices, all those dialogues - it was too much for me to do it flawlessly. More than just a bunch of "go there" goals so that player would know what to do. So I think I have accomplished that and I'm happy. The story is now literally bigger because I increased dialogue font size! Loot box now shows up to 170 items! I have updated boss missions to use all minions, instead of just scions, sentinels, and gatherers. It also supports Manifestations of Destruction and doesn't support The Decision modifiers now, so it's, well, better. I have added more bulwark blocks for siege missions, now there are explosive blocks that destroy blocks diagonally when hit and blocks that contain loot! Finally, the arena missions have been improved significantly. Now they support The Assault of the Modified and The Rain of Fire modifiers, and you no longer need to keep going back to summon new minions. And now I'm going to work on endgame content! The current plan is to make the procedurally generated region with objectives and rising loot quality, war to secure all areas, new mission type, and more relics! Improved loot box: Up to 170 looted items visible, glitch free. Improved arena mission: Better loop, supports The Assault of the Modified and The Rain of Fire modifiers. 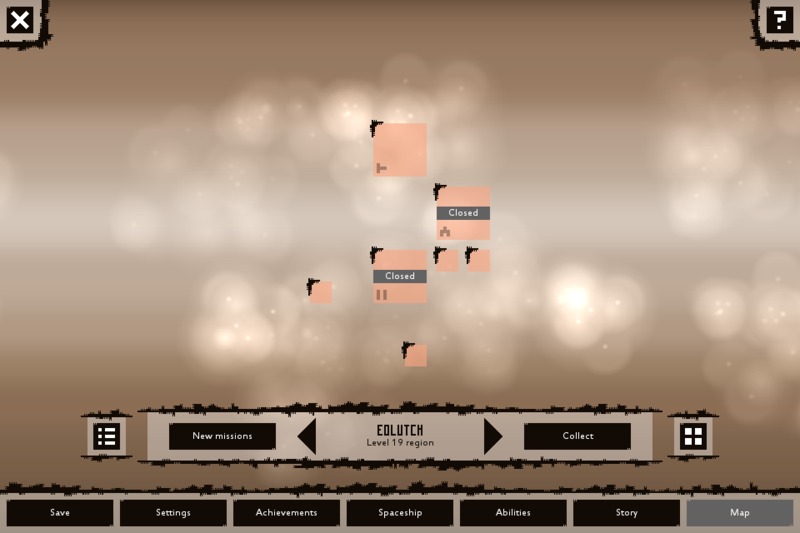 Improved siege mission: New blocks, minor graphical improvements. Veteran's and revenant factory’s ballistic attacks are now slower. Lock advanced features if the player level is lower than 5. 80% of the tasks completed. I’ll post again when the percentage will reach 90%. Bearman_18 and IndianaBones like this. Sector Six Release Countdown: 2! Sector Six endgame content batch 1 is done! Complete areas in procedurally generated regions that are in Broken Infinity to gain loot quality bonus. 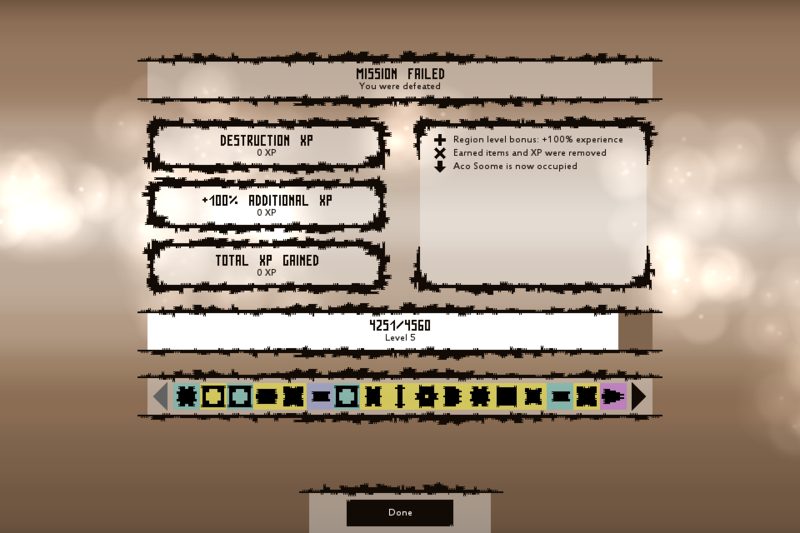 Includes instance boss missions and increased chance of spawning uncommon mission types. In the endgame, random regions get scaled to your level, so you can complete missions in low-level regions and secure areas you haven't secured yet. Securing all 144 areas in Sector Six will reward you with a very powerful relic. Obtain all relics in the game to get a special relic that will appear in all your saves. If there will be a demand for more content, I'll add more endgame activities. The new ETA is 13 days. I am going to make another post about my plans for the future of Sector Six, pre-release beta, and out of Early Access release, so until then! Testing, uploading new achievements, etc. IMPORTANT: Saves will not be erased after pre-release beta. IMPORTANT: In pre-release beta, the game is essentially complete. The beta is just in case, I expect Sector Six to be without any major flaws at this point. During the beta, I'll ask everyone to play the game to find as many problems as possible! There's a lot of new features and it's too much for me to test on my own. 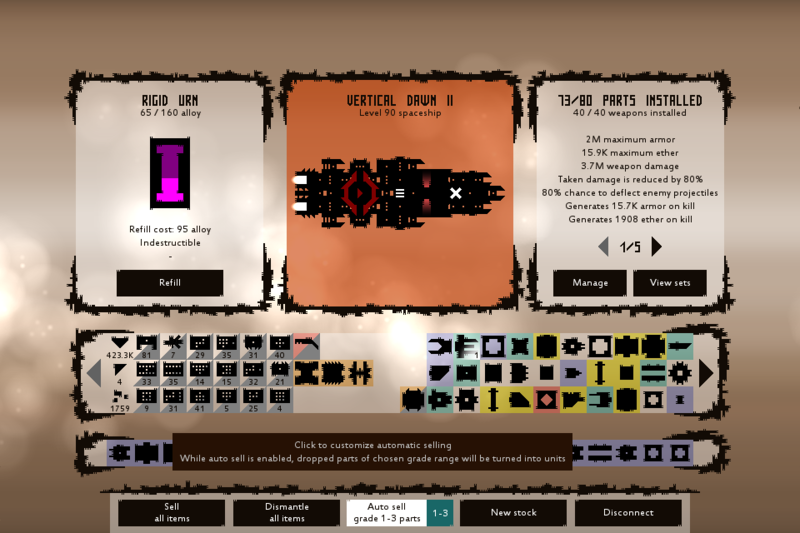 During this period I'll also be making a new, final Sector Six trailer and updating the store page. During September, I'll be releasing updates to fix glitches and balance things, if needed. After September, I'll either start working on a new game or continue developing Sector Six. This depends on the number of sales. 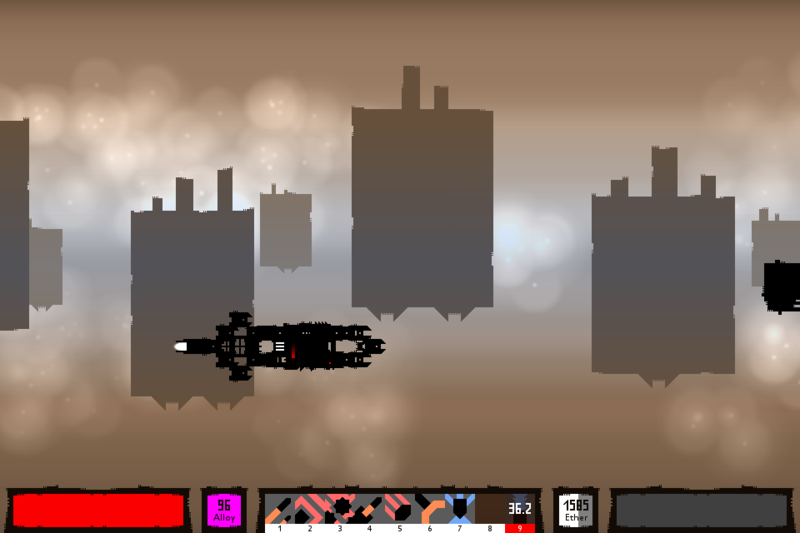 If the game will sell much more copies than it sells now, on average, I'll continue working on Sector Six. I doubt that it will happen, but it's not impossible. If the game will not sell much more than during Early Access, I'll move on to the next game. I'll still update Sector Six annually to add the content that is currently missing. - Two more bosses for boss missions. - Improved armored colony seeker. 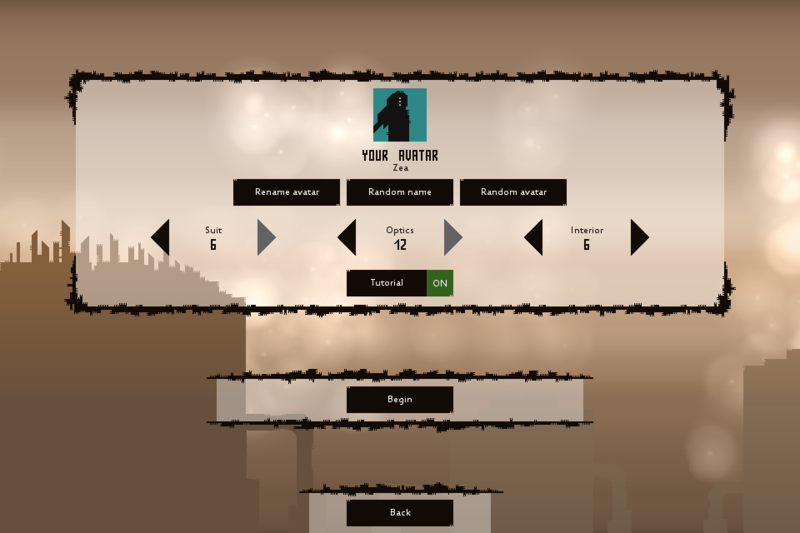 - Improved mission entering and leaving times. - Intellect Encryption Template activity. 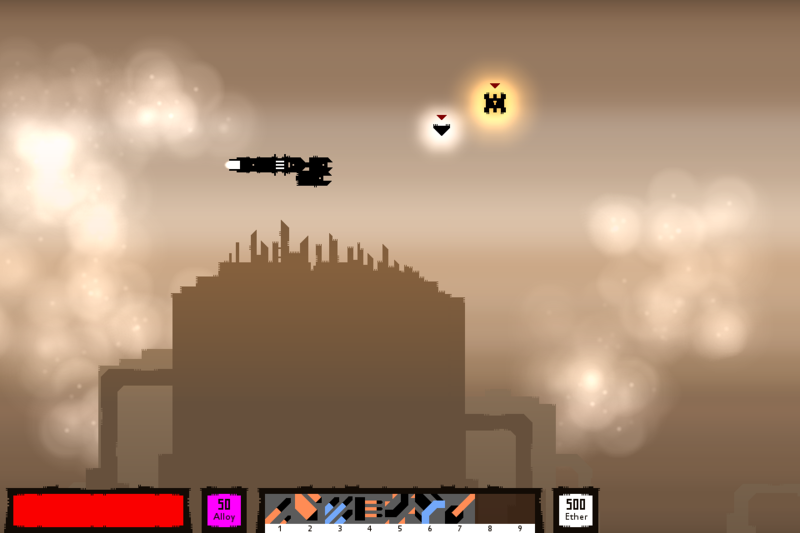 - New enemies and ruins. Like always, I will do everything based on feedback and analysis, so these lists will probably change. Sector Six Release Countdown: 1! About 3 years and 8 months ago, I have started working on Sector Six. And now it's finished. When I started working on Sector Six, I thought that I'll complete it in 3 months. It was supposed to be a small sequel to Sector Seven. I wanted to make it just because I promised I'll have a sequel to Sector Seven. 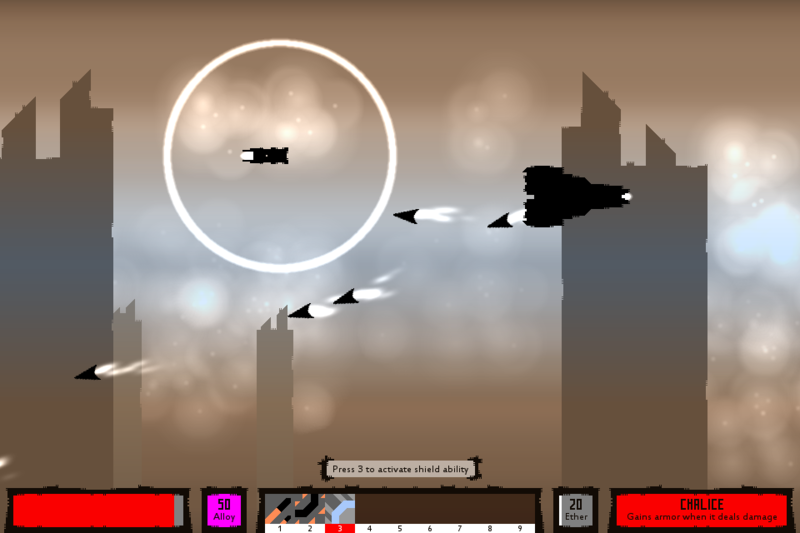 It was 2015 January or February when I have released an alpha version of Sector Six. I didn't expect anything and I was surprised to get positive feedback. It was enough for me to thinking about making Sector Six into a bigger game than I initially planned. I said to myself: "People like this, and I can do much better so why not do it?" So I started working harder. Hundreds of times I decided to rework something because it wasn't as good as I could do, and I'm very glad I did. Sector Six is not perfect, but it is about 10 times better than I imagined it in the beginning. And it is like that because of feedback. Every "Great game, but X could be better" made Sector Six better. I always wanted to be a game developer and make games like Sector Six and I'm incredibly happy and grateful that it happened. I hope that this is not the end of Sector Six. I hope I'll be able to continue working on it and make it even better. Sector Six was finished on 21st August. 22nd August was a bad day - I had problems with a monitor, so I had to spend an entire day fixing them. This day I was testing Sector Six. I have already spent like 8 hours testing the game, and I have only completed half of the story. Tomorrow I hope to finish testing and with luck, Sector Six version 0.9.9 will become available for everyone to play in the weekend. Compressed part rework: Parts received from drops, removed manual compression, added super compressed parts. Mission 6 boss fights now end earlier. 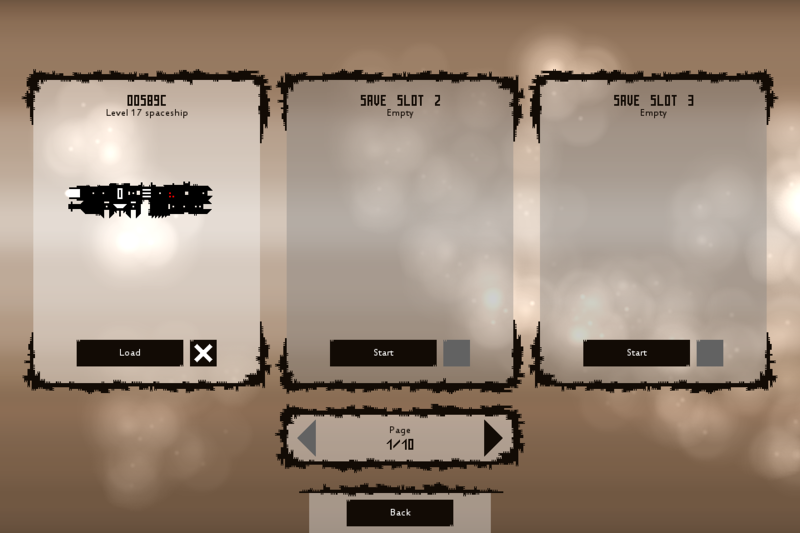 Added new particle settings: Now you can tone down particles, instead of turning them off completely. Improved optimization: Game will now run better. Moved tips to separate interface. Reworked evolving mechanic: Now minions evolve while attack abilities are not on cooldown. It’s no longer possible to use weapon amplifiers on engines. It’s no longer possible to sell items that have no value. Now it’s possible to use anodes on compressed parts. Rearranged achievements in the achievement interface. Improved Ionize ability: Now adds extra 2 alloy per ionized enemy, glitch free. Awakening of Inner Power ability now supports all mission types. You can no longer install alloy containers if their level is higher than your spaceship level. Now locked until the spaceship level is higher than 4: Difficulty system, set interface, item management, new missions button. Secured region changes: Removed manual compression from secured region interface, added highlight toggle button. Improved shield particles, sounds, and animations. 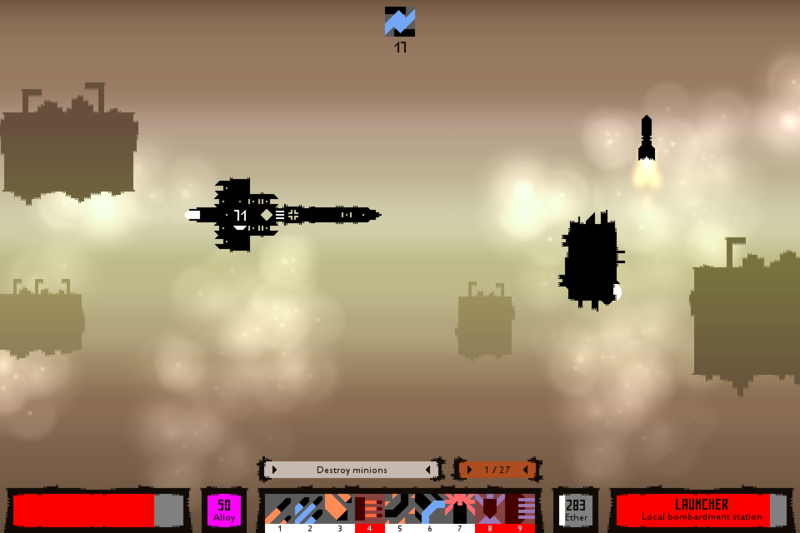 Spaceship collisions with certain objects are now better. Improved cooldown and effect timer text: Now shows second fractions. Reduced amount of units dropped. 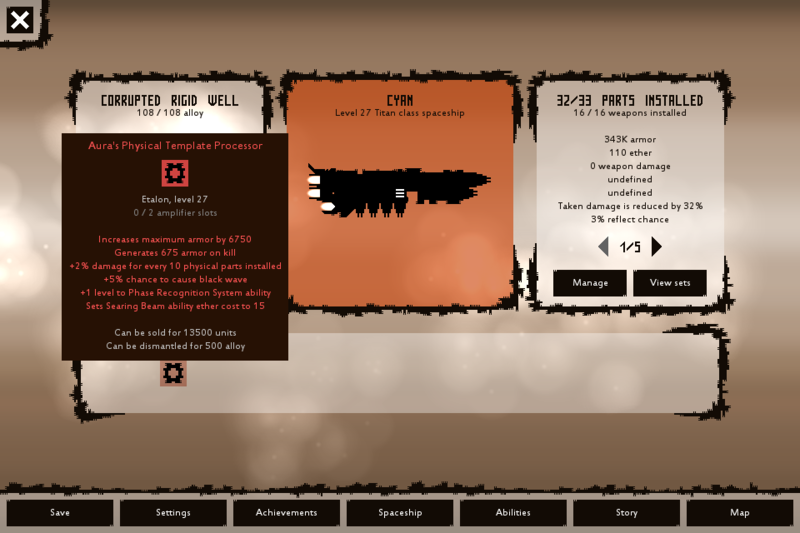 Improved region rewards: Now includes uncommon and rare rewards, such as five fractal parts, +200% experience, etc. Replaced gauntlet missions with new retrieval missions. Changed music system: Now tracks in side missions play regardless of area status. Changed time vortex: Improved dialogue, can only reset story, made it more accessible. Changed contribution system: No longer saved between missions, must be claimed immediately. IndianaBones and RichHopefulComposer like this. Sector Six version 0.9.9 is now available! Play now! Important: Your saves will not be deleted from now on. The story campaign is finished! Will you stop the Machines? The most powerful parts ever! Each relic comes with unique skin and game-changing effects. Modify your ability ether costs and cooldowns by installing reworked nodes and pylons! Abilities now unlock with level and they are no longer bound to classes. More possibilities and better progression! Ether properties now scale with level! Everything that relates to ether has improved. Loot quality is now affected by minion strength and difficulty level! Plus, tons of improvements to all sources of rewards. Compressed parts are now obtainable from drops and region rewards! Manual compression has been removed to make super compressed - 4 in 1! - parts possible. Fight in forever changing, procedurally generated instances of Broken Infinity! Made for experienced players: Higher chance of rare mission types, harsher failure penalties, and a huge boost to loot quality! Secure every area in Sector Six to get Ultra Aegis, Ascension Catalyst! Random regions get scaled to your level: Return to low-level regions with a high-level spaceship for the final battle against the Machine minions. Sector Six will come out of Early Access on September 7th and I need your help to spot problems - more than ever! I can't guarantee that there are no crashes/balancing issues left, but most of the content should work as intended. Sector Six: Now out of Early Access! After 3 years of development, 2 years of Early Access, hundreds of changes, fixes, reworks, and additions - Sector Six is finally complete! Sector Six is a shooter with many RPG elements: Inventory, procedurally generated equipment, a leveling system, rewards, story missions, and so on! Your goal - alongside stopping the Machine invasion - is to build the best spaceship ever. Unlike arcade shooters, in Sector Six won't be fighting more than 5 enemies at once, but fights are more tactical and enemies can take more than one shot. Most enemies have unique attacks or weak spots, which means that the more you play, the more skilled you'll become at fighting those enemies. You will also get better at using your spaceship's abilities - there are 31 active combat abilities and 9 of them can be taken to battle. The final and most important layer of your progression is spaceship building. 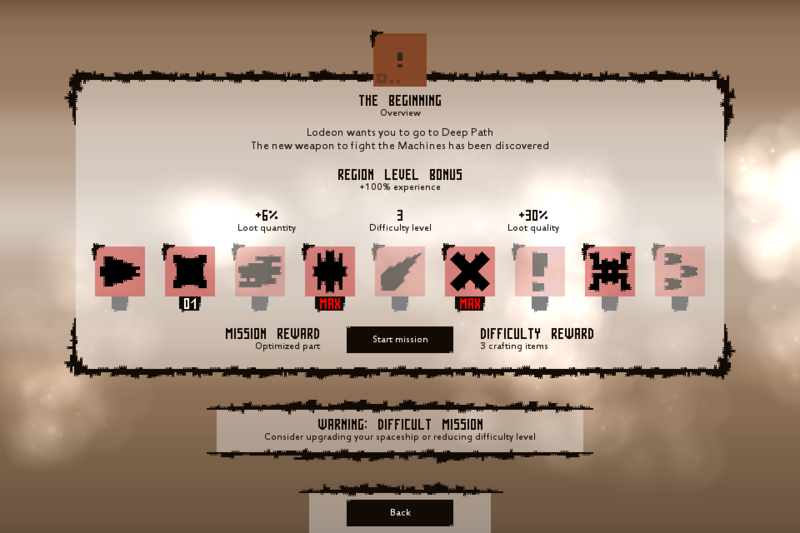 Destroying enemies will reward you with procedurally generated parts. There are 7 rarity grades of parts, starting with generic parts, that are most common and only have one property and ending with relics, that are rare, have 7 properties, unique skins and effects. There are also part sets, that unleash game-changing effects if you install 6 parts of the same set. 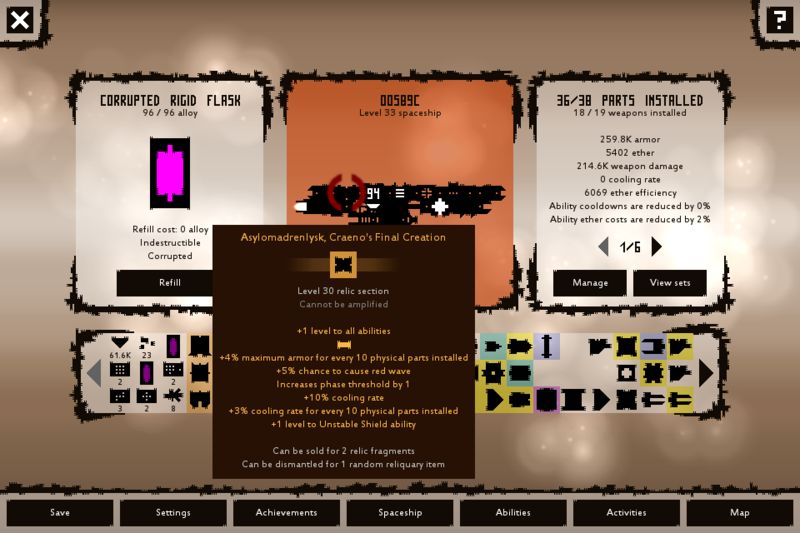 You can install up to 80 parts, up to 9 relics, and have one set effect active - and if you'll find a right way to combine them, your spaceship will become unstoppable! The better you and your spaceship get, the more difficult missions you can complete and modular difficulty system allows you control almost every aspect of difficulty - even enemy swarm size and mission length! Increasing difficulty increases rewards, which will allow you complete even higher difficulty missions - so you can keep pushing yourself. But you can also play the game just for the story. Each story mission has something that other missions don't have, they vary in length and structure, have dialogues, cutscenes, bosses, special events, and enemies. 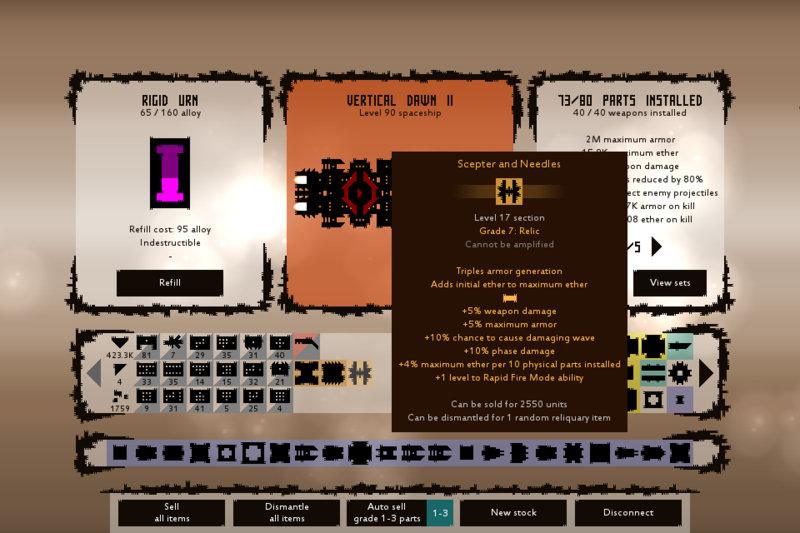 Version 0.9.9 has added the remaining story missions, endgame content, new bosses, relics, and more. 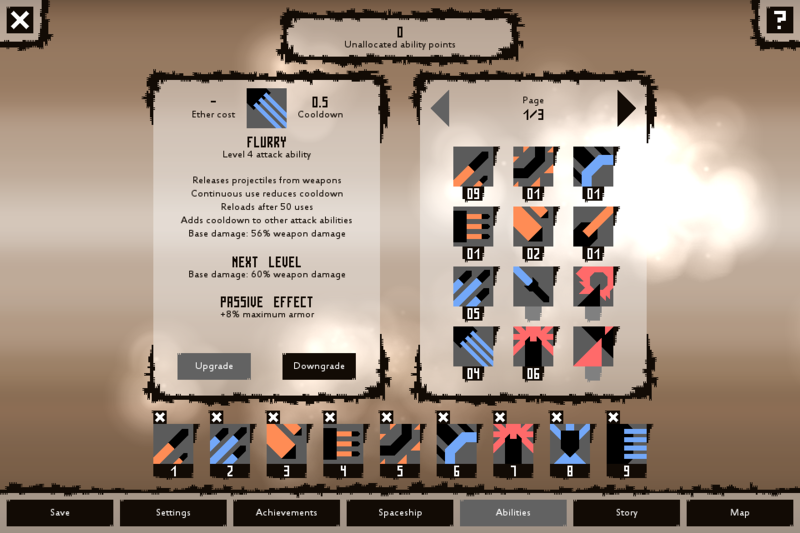 Weapons, ether, abilities, and reward systems have been improved as well. Fixed: The apostrophe symbol is missing and a black box is displayed instead. Fixed: It's impossible to choose Ourend's black option. Fixed: Time Vortex description wording mistake. Fixed: Aggression ability mentions "Maximum damage" instead of "Weapon damage". Fixed: Shield destroys ruins even while inactive. Fixed: Channel ability doesn't have a cooldown. Fixed: Impossible to close the mission reward screen after reaching maximum level. Fixed: Black Rain deals damage based on cooling rate instead of weapon damage. Fixed: Crash caused by getting armor above maximum with armor generation. Fixed: It's possible to access missions 11 and above from Sector Five. Fixed: Upgrading and uninstalling ability uses the same controller button. 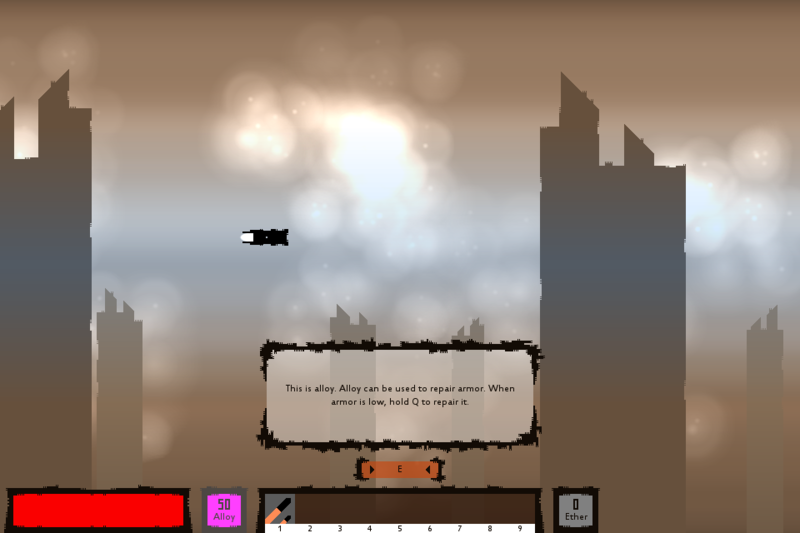 Made minor changes to Channel ability sounds and particle effects. Improved Channel ability level scaling. Made minions drop more units. Improved main interface and settings page buttons. Made beacon stop repairing after a repairing a certain amount of armor. Returned "Gain XP" toggle button. Added button to toggle mission objective hiding. Made elimination mission objective show remaining minions again. Improved killer's seeking missile attack. Made new achievements flash when seen. Changed Concentrated Fire to need reloading every 50 uses, instead of 25. Compressed parts no longer drop: Instead, use compression modules to get them. Replaced decompression modules with compression modules. Made beacons spawn only in level 6+ regions. Made parts give more part upgrade chance and removed "Part upgraded" message. 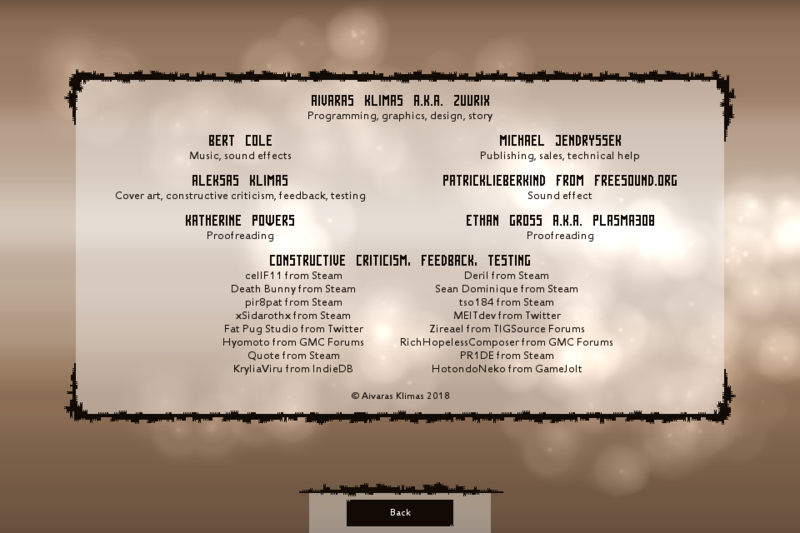 For a week or so, I'll be taking a break from development, while keeping an eye on discussions, comments, and reviews. After that, I'll be working on weapon, cooling rate, and ether efficiency rework + shared stash. After that is released, I'll be looking for your feedback to help me decide what the game needs most. I played it yesterday for the first time in probably years. It feels more fun and engaging than it was. Good job. Update! XP and experience changes, fixes + new content! This update should fix the last problem with the save system, hopefully, save files will no longer get corrupted. If you're still having problems - report them immediately. I also recommend backing up save files just in case - don't forget that Sector Six save file folders get synced and backups get erased in they are stored there. Added new relic: Incarnation of Impossibility, Trapped Phasar. Added new relic: Amplifier Well, Upgrade Sockets. Added new relic: Duality of Transience, Etherion's Catalyst. Added new relic: Mark of Defender, Hero's Exempt. Added new relic: Strengthsource, Tridenkorian Flagship Systems. Enemies now give 200% more XP. Boss enemies now give less XP, but with global 200% increase it should still be right. Reduced region XP rewards back to 50%/100%/200%. Players will no longer gain XP after failing mission. Players will no longer gain XP in lower level regions. 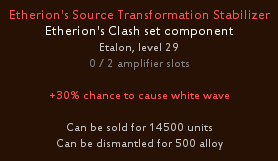 Reduced mythical part and etalon prices. Removed generic and optimized part vendors. Removed some of the advanced part vendors. Replaced removed vendors with fractal part vendors in regions 2, 6, 9, 15, 17, 20 and 29. Replaced removed vendors with part vendors in regions 2, 8, 15, 18, 20 and 25. Reworked Guardian of a Thousand Worlds ability. Reworked Breach ability: Now deals weapon damage whenever enemy shield is removed. Searing Beam now unlocks at spaceship level 18. Entropic Missile now unlocks at spaceship level 4. 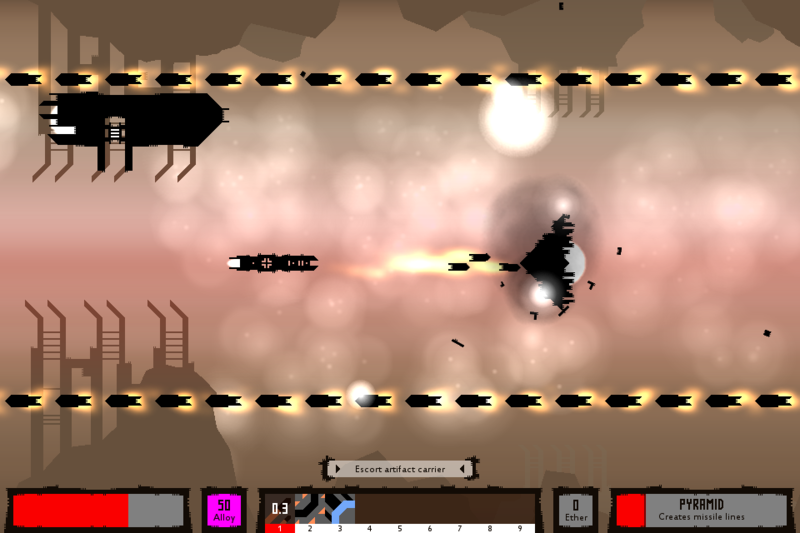 Spread Mines and Detonate now unlocks at spaceship level 12. Attract Mines now unlocks at spaceship level 13. Creation of Energy now unlocks at spaceship level 22. 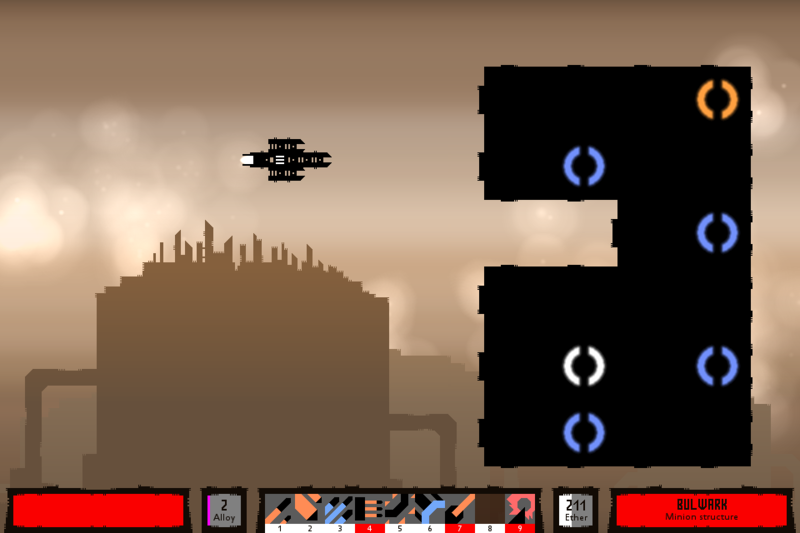 Concentrated Fire now unlocks at spaceship level 6. Phase Recognition System now unlocks at spaceship level 11. Entropic Fracture ability has been renamed to Dimensional Fracture. Unstable Shield ability has been renamed to Heat Shield. Entropic Missile cooldown has been increased to 10 seconds. Entropic Missile ability has been renamed to Nuke. Capacity ability has been renamed to System Capacity. Resistance ability has been renamed to Defense And Retaliation. Moved Rapid Fire Mode animation. Made minor improvements to Assemble Obelisk ability. Player bladed mines now pierce destructible minion segments. "Phase threshold" changed to "Phase charge speed". "Phase intensity" changed to "Phase damage". Optimized parts now have two properties, but can no longer be upgraded with amplifiers. Dropped parts can no longer have cooling rate and ether efficiency. Changed part upgrade chance: Creates pop-up, upgraded instantly. Instead of "Warning: Difficult mission" game now shows recommended spaceship armor and damage for that mission. Waves now affect all minions on screen - minions outside the screen are not affected. Changed what minions spawn in regions to reduce repetition. 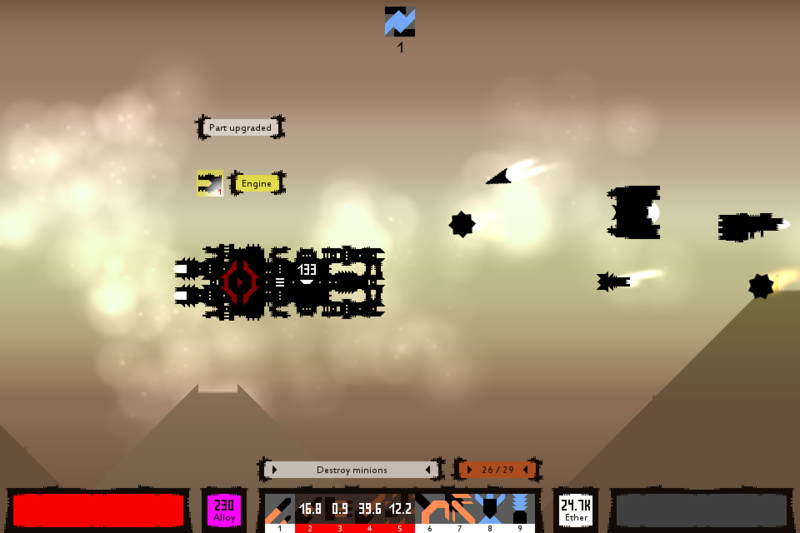 Effect timers no longer stop while spaceship is in a dust cloud. Improved mission 1 artifact carrier collisions with the player. Reduced the number of missions required to fully clear regions. Note: Changes will be visible in new saves only. "Press any key" now applies to the mouse in a first game screen. Fixed: Physical part boost calculation mistake - works with virtual parts as well. Fixed: Damaging wave damage calculation mistake. Fixed: It's possible to break story mission 1. Fixed: Mission 3 database collision bug. Fixed: Oesa's Radiance set effect is not changing maximum armor correctly. Fixed: Overload ability cannot reduce spaceship's armor to 0. Fixed: Phase delay timer graphical issue. Fixed: Players can receive level 91+ items. Fixed: Vendor hint is visible after the player gets advanced access, not before. Xer0botXer0 and sitebender like this. I've been working on another weapon rework for a while now. The first weapon rework made pylons and nodes reduce ability cooldowns and ether costs. It was a good idea on paper, but because pylons and nodes don't affect attack abilities, relays were much more useful than pylons and nodes. So I have decided to have another rework to make pylons and nodes useful. Another goal is to increase attack variety. Second weapon rework makes all weapons increase weapon damage, and work differently with different abilities. For example, Missile Strike will release missiles from relays, shards from pylons, and AoE waves from nodes. Same is with other attack abilities, so in total there will be 9 different attacks, 3 for each weapon type per attack ability. As I'm writing this echo, I have already made 8 attacks, only one to go! So that's part 1 of the second weapon rework. Part 2 is to re-implement ability cost modifying effects to the game. Part 3 is giving abilities weapon synergies. For example, installing relays will increase the chance of Shards of Chaos ability releasing 10 shards instead of 5. Most of the abilities should have some sort of weapon synergy effects. It's a lot of work to come up and implement these effects, so I will be adding them gradually. Attack ability changes and new relics should come out with the next update. The next update should be released this month. Aside from weapon rework, the update will include new enemies and time attack mission rework. The pace and feel have been so vastly improved from the build I played when I made my initial comments a while back, I'm impressed. I could label each and every improvement but I think you are fully aware of them: you made it after all. But to cover them briefly, the enemy encounters are much more satisfying, the user interface is nice and readable, and the graphical feedback is much more visceral. The interface really needs more feedback on why you can't do something. During the tutorial I had several moments where I was trying to do what I thought the tutorial wanted, but then realized I couldn't because I needed to press 'E' to continue. It's a small thing, but rather than just preventing the player from performing the action I'd suggest either letting us do it anyways and have the tutorial just skip past whatever you didn't read, or give some sort of an error noise and make the 'PRESS E TO CONTINUE' box flash or something to draw the eye. Again, I stress this is a small thing but there are other places as well. When you are in the ability upgrade screen if you want to upgrade something you click the box and it upgrades if you have a point, or doesn't if you don't. But if you don't have a point, giving some feedback as to why the button doesn't work, getting rid of the button if you can't upgrade, or adding some visual effect to the button when you can or can't upgrade would make it all more coherent. When you are looking at the abilities your vision is on the ability screen, not how many skill points you have. All you see is just an upgrade button that doesn't work when you click it. Like all systems in the game you can figure it out through trial, error and intuition, but little details like these don't just make the game more understandable at a glance, they can also make the experience of upgrading more exciting. I don't know if this changes later on, but the ship feels sluggish and imprecise. It might be worthwhile to tweak your values there, it's not bad but it doesn't feel great either. The damage sound effect, that 'tink' noise, just has never `clicked` with me. It does it's job, but it isn't all that satisfying. Perhaps a wider variety of sound effects for different types of damage? The `tink` makes sense for armor, but as you start breaking apart ships, something a little meatier would add to the thrill of destroying enemies. Some sort of danger from behind? You'd have to telegraph it, but it feels like the rear of the screen is only used for story purposes. Anyways, those are my initial comments. Congratulations on your 1.0 release (and subsequent patches)! I also seem to have encountered a bug? I keep getting 0 XP for doing things, so despite having done six or seven missions I'm still at level 2. It says I earned XP for destruction, plus some bonus for my ship status and 0 XP total. If that's intended it really needs to be made clear why. I assume it has to do with the level of the area versus my level, but if that's the case it would be wiser to use some sort of XP scaling than just making it 0 when a mission is over. Pacing ... I dunno. Combined with the above there's this impetus to level up, which means going to the hardest areas, but the hardest areas are often quite difficult. While you get to keep the stuff you found during a mission, you don't gain any XP. So your only choice is to play it again, or I suppose arbitrarily grind out content in a weaker region to maybe improve your stats? It's kind of unsatisfying. There's also an issue where what stats do is a bit vague. Ether efficiency +600, what does that do? Is that good? How does weapon power relate to how much damage I do? You said above relays are important because they actually emit projectiles, so is it actually better to have one projectile with lots of power or a bunch of projectiles with less power? There really outta be some sort of passive ether generation. Maybe there's an item you can find that has it. There's all these items that increase your capacity but it seems rather pointless since there's no reason to hoard it. There's weird thing about always knowing something, just somehow that knowledge stays... in the back of mind. Feedback like this brings the knowledge out of there and it feels strange. It's like knowing and not knowing at the same time. I still make UX changes, so maybe I'll improve this as well. I increased movement speed and made acceleration slightly faster. Maybe that will do the trick. I'll try to change the pitch of the sound and use the different pitch versions as armor goes down. Hmm... Something to think about. Congratulations on your 1.0 release (and subsequent patches)! I also seem to have encountered a bug? I keep getting 0 XP for doing things, so despite having done six or seven missions I'm still at level 2. It says I earned XP for destruction, plus some bonus for my ship status and 0 XP total. If that's intended it really needs to be made clear why. It says "REGION EXPERIENCE STATUS: You will no longer gain experience on this region" in the mission overview.There's no reason why it wouldn't say that on the end screen as well, another thing to add to UX improvement list. I like it but it's missing something to really make it stand-out. I don't know if it's the pacing or what, but it's not quite there as a hook. You've done a lot to improve it over the last six months, and it really shows. I'm excited to give your changes a try when they come around. Here's to hoping your audience expands as well! I like it but it's missing something to really make it stand-out. I don't know if it's the pacing or what, but it's not quite there as a hook. Sector Six is a unique game, but I don't think it provides unique experience. You could find the same loop of destroying enemies for random loot in many other games. For example, Sector Six's alloy containers: They are very different from, say, Torchlight's generic health potions, but in the end they both heal. Hopefully I won't have to get a job. Bless my parents. Actually, come to think of it I did have a small suggestion for you. The various drops that come out of containers and enemies, it would be nice if they were 'attracted' to your ship so you didn't have to so precisely move into them to pick them up. Since the player wants those items, it does slow things down a bit to pick them up. It could be just a slight magnetism when your ship is near, or even if they were just attracted to your ship at any distance. But I do think that would be a nice little improvement to the core loop. And when I say it's missing something, don't get hung up on that. You are right: the pieces are there. It drives me nuts because I can't point at something and say "that right there, it's missing" or "you should change this". I like to give useful feedback. I think by and large it's a decent game, but the difference between decent and compelling is where I'm interested. I have no doubts someone could happily spend a few hours with it, and that's testament to all the work you've put in. But it feels like it's missing some little hook somewhere to really tie everything together. Anyways, I'm waiting on the changes you've detailed before giving it another go. It's been cool to watch it evolve. I'll definitely add magnetism. I was always happy with how easy it is pick up loot in Sector Six and that you don't have to worry about inventory space during gameplay, why not go one step further? If you haven't played for long, chances are that you haven't seen the real Sector Six yet. It gets real when you enable difficulty level 9 (most importantly Hivind's Army, the modifier that basically tripples the enemy amount on screen) and have a decent enough spaceship to be able to blow them up. Then it's much more intense. Small enemy attacks start overlapping, you have to pay attention to multiple things at once and your attacks have much more effect because they hit more enemies. But that requires more skill and understanding of how the game works. Anyway, back to the question of the hook - maybe it is just small things, and not the entirety of the game that cannot be changed anymore. 1) It takes time to enter the mission and leave it. Far too long, probably. Bigger games have the excuse to play cutscenes while loading or something, but entering/leaving missions could take a millisecond for Sector Six. SOLUTION: Cut the entering and leaving time entirely or by 90%. 2) It takes time to get from one enemy to the other. If there weren't gaps between enemies, the gameplay would be continuous, non-stop combat. Now it's kill, move, kill move... Since combat is decent, maybe there's just not enough of it? SOLUTION: Add a skill or something that allows you to jump to the next group quickly. There's absolutely have to be gaps between enemies because that's how everything is designed. Problem is that needs more tutorials and more buttons. Maybe I can remove some less needed features in exchange for jumping. I can also triple enemy amount on default, instead of making it a difficulty modifier, although that might be too much for a new player. Or maybe that would... hook them? 3) The big thing. Spaceship building takes far too long. Item management is a massive pain, especially in higher levels, there's no way to sort, or compare them, only highlight them, and that isn't good enough. I don't know if you had seen this problem yet, but it's what scares away some percentage of people. SOLUTION: I could quadruple part stats and divide part limit by 4, so there's 4 times less item management. But then the big ship building would be a thing of the past and it's very important. I guess I could also make parts larger? That would allow me to give them more details, which could be a huge win. This change would also damage the importance of leveling up, because now every time you level up, you can add more parts. But I can expand leveling up further, right now part limit doesn't increase beyond level 75, and max level is 90. I mean, look at this masterpiece of a ship, it wouldn't be possible with big parts. Then again... Maybe it would. Maybe big part parts could have all sorts of intricate shapes, that make ships even cooler. With smaller part count, it would be a lot easier to re-skin them - yes, the game has this feature as well. It's messing with the game's identity, and it could have catastrophic results. Well, if I had a bigger player base, anyway. What I should definitely do is add more filtering options. I can't do sorting, because inventory is not data structure based, the values are shamefully stored inside objects. Do ship building rework or not is a big question, but there's no reason to not do 1) and 2). It doesn't matter now anyway, I don't think it will reach popularity, because it's too far after release, but maybe I can make those few people that will find it have fun longer and make me even happier with the game, which could be worth it. My sanity tells me that it's time to properly abandon this flawed game and move to the next ASAP, because this one won't be as good as the new one, because it's better to start with new foundations, without mistakes I made when I was more inexperienced. My insanity says: You've come this far, why not make the game PERFECT?! PERFECTION IS EVERYTHING - SACRIFICE EVERYTHING. It's been difficult to listen to sanity. And yes, the sequel will happen, ETA 5 years, I got other projects in the queue. Well, I'll start by saying magnetism would help with 'speeding up' the levels. Right now it's very satisfying to charge through groups of enemies firing off your special weapons. You get slowed down a lot by credit and item pickups. Those pickups are good, so you want them, but having to go back repeatedly because you kept missing something by a few pixels is more where I think a little modification would make a difference. So I don't agree with it takes too long to get between enemies, I think sometimes you get hung up between enemies for a reason that could be tweaked a bit to alleviate it. I also think the ship building is one of the strongest points of the game and really does reflect the unique draw, so I have no complaints there. Sorting or filtering would definitely help out with it, especially if the game really ends up rewarding min/maxing of your stats. As a cheaper alternative, if that just isn't doable for technical reasons, you could also just add highlighting. That's imperfect, but if the player just wants to see their relays or something like that, it would be good enough to just highlight them. As for taking too long to enter and exit a mission? It takes too long to die and leave a mission. Right now, if you die, your explode. Then you are rebuilt. Then you warp out. From a player perspective it's odd because if I regenerated, then why can't I try again? And if I have to flee, then why not just take me back to the menu or give me the option to retry right there and then. About 'the real sector six'. This is a danger: if the 'real' version doesn't come until later, you should really emphasize the player reaching the place where the game is the most fun. The most egregious example I know of is Final Fantasy XIII. Supposedly the game is really awesome after you've been playing for as many as ten hours. TEN HOURS to get to the 'good parts'? You might appreciate the improvement later on, but there's a good chance your audience will not hang around that long. And lastly, as far as success: you aren't a AAA publisher so the release standards you seem to have adopted don't exactly apply to you. Your game could erratically receive a cult following ten years from now. One moderately popular streamer could easily cause a sudden influx of sales. The creator of Dwarf Fortress has a very devoted following of people who support him via Patreon rather than sales of his game. If you've failed to find an audience that doesn't mean Sector Six is a failure, that means you've failed to find an audience. Unlike a company that has shareholders to impress, if you make a hundred dollars today or tomorrow: you'll have made a hundred dollars. It's true you've missed your Steam launch window, but 99% of all games never go beyond that. If you keep putting in the work and plugging your game in various outlets, you really never know. It's true you may never find that audience, but don't confuse the two ideas: you can have a good game and no audience, and a huge audience and an awful game. The question becomes can you keep trying to find that audience and do you want to? Either way, I hope you find some success in doing so. Well, I'll start by saying magnetism would help with 'speeding up' the levels. Right now it's very satisfying to charge through groups of enemies firing off your special weapons. You get slowed down a lot by credit and item pickups. Those pickups are good, so you want them, but having to go back repeatedly because you kept missing something by a few pixels is more where I think a little modification would make a difference. Yeah, that alone might be enough. I played around with the previously mentioned movement speed increase, and it feels kind of right. I also think the ship building is one of the strongest points of the game and really does reflect the unique draw, so I have no complaints there. I'm glad you think that! Wouldn't want to repeat the mistake of Hi-Rez who ruined their unique battle royale game, by trying to make it more similar to Fortnite. That's imperfect, but if the player just wants to see their relays or something like that, it would be good enough to just highlight them. This is already in the game, just locked until level 5. 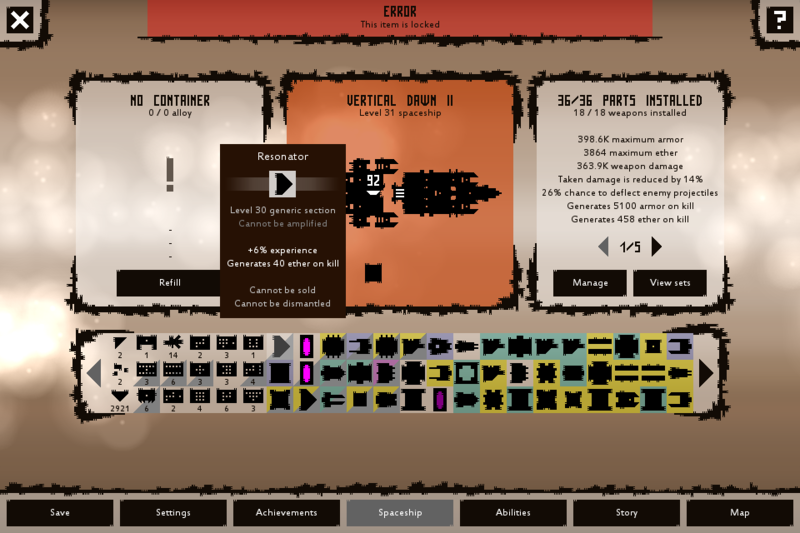 (the "Manage" button in spaceship building screen). What it doesn't do, is highlighting items with certain properties. E.g. : You can make it highlight relays, but there's no option to highlight relays only with ether generation. Wouldn't be too hard to expand to that. You can get to it right now, by unlocking difficulty modifiers (settings > change ship name to ADMIN > press "Advanced access" OR just reach level 5, shouldn't take too long) just you won't be able to do what I did, because of lack of experience and equipment, allegedly. You get much better rewards with increased difficulty, so players are supposed to get there as soon as they are comfortable with the game. I often find myself making the game more and more difficult as I play (with modifiers, I mean), so it should be good. If the player doesn't want to increase difficulty, that it's okay too, as long as base difficulty is fun. Again, I can try to increase the enemy amount on base difficulty, but it's risky - I worked so hard to make the intro as new player friendly as possible, and now I don't want to ruin it. As for taking too long to enter and exit a mission? It takes too long to die and leave a mission. Right now, if you die, you explode. Then you are rebuilt. Then you warp out. From a player perspective, it's odd because if I regenerated, then why can't I try again? And if I have to flee, then why not just take me back to the menu or give me the option to retry right there and then. Right now my plan is to make a new game every 1-2 years until I make enough money to be able to do 5+ year projects. I love working on games for multiple years, as I found out by making Sector Six, so I want to do that in the future, as soon as I can. Sector Six is not exhausted, but many things that I would like to change about are so big, that it makes more sense to do a sequel. For Sector Six, I still want to do few updates to finish up, maybe even one more big rework, if it proves to be needed, but it's time for a new project, one that matches my current level of experience. I know one YouTuber that might help Sector Six to get some of that sweet success, but if he doesn't react to my email, that's... basically it. I'd need a miracle. For the next game, I'll pay more attention to marketing to not have to rely on a miracle. Update! Weapon rework and new content! The biggest update since the release! It makes all weapons useful, adds new relics and enemies for more variety, improves time attack missions, and more! Planar is an alternative version of sentinel. It's a medium - threat level 2 - enemy. 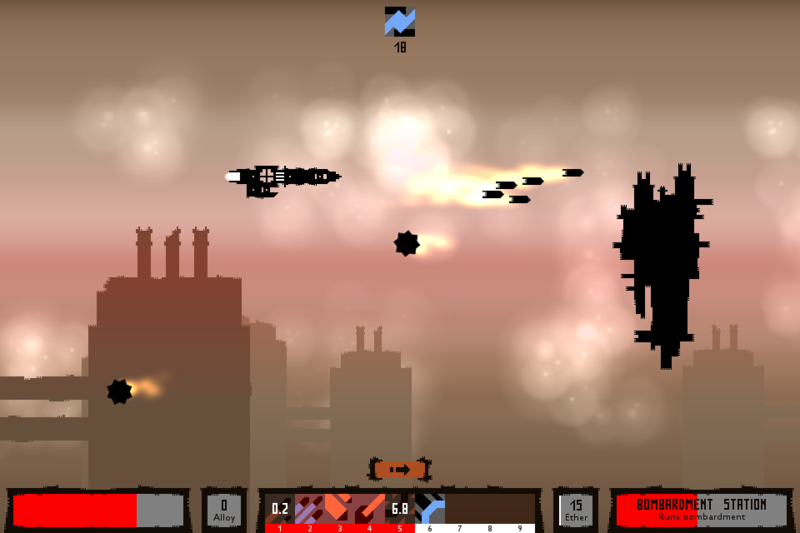 Currently, it's the only enemy that releases projectiles from the left of the player ship. Like a sentinel, planar uses a shield but activates it earlier. 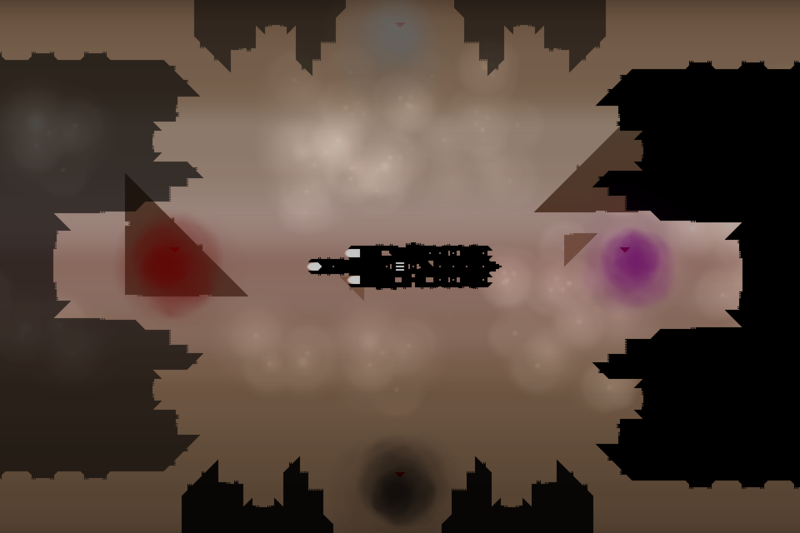 Planars can be encountered in regions 20, 23, 27, 29, Broken Infinity, and arena missions. 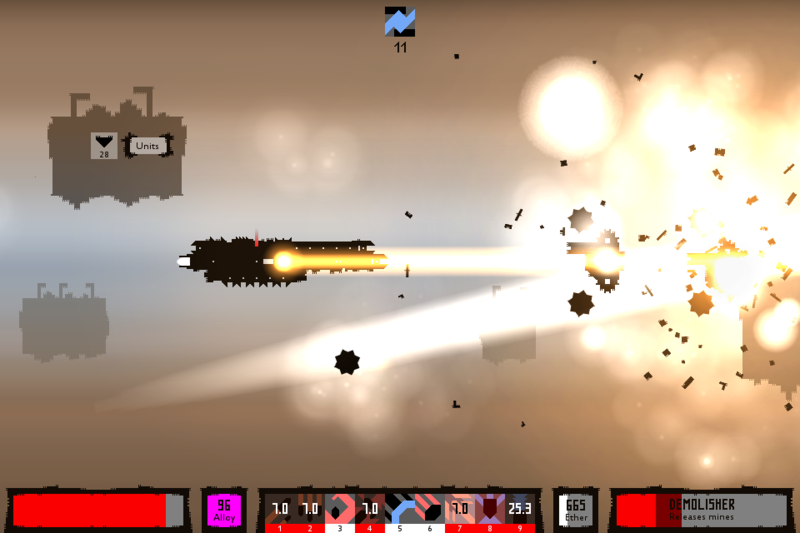 Launcher attacks player by launching missiles, that fall on the player from the top of the screen. The launcher is another medium, threat level 2 enemy, it also uses a shield. I want to increase the number of shielded enemies to keep shield removal abilities relevant - weapon rework adds two attacks that ignore shields. It's why I changed Breach ability as well. Launchers can be encountered in regions 10, 12, 14, 17, 20, 22, 25, 28, Broken Infinity, and arena missions. Wasp is a threat level 0 enemy, comparable to swarmling. Unlike swarmlings, wasps have high damage for a threat level 0 enemy. Wasp's only attack ability is telegraphed, giving you more than enough time to move out of the way of attack. Wasps can be encountered in regions 7, 9, 12, 16, 22, 24, 28, and Broken Infinity. Weapon rework removes ether efficiency and cooling rate, making it impossible to change ability ether costs and cooldowns by installing nodes and pylons. Instead, I have added new relics that have those effects. 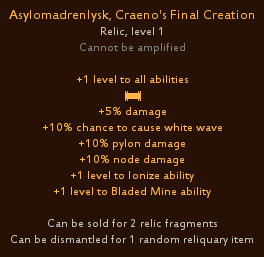 I have also added two relics that are not related to weapon rework, but also expand the possibilities. As usual, new relics come with unique animations. 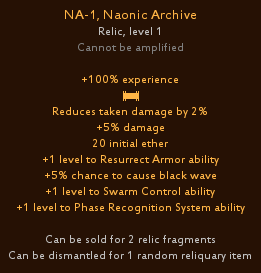 This relic halves ability ether costs and maximum armor, which is a small price to pay for cheaper abilities. This relic halves ability cooldowns and doubles ability ether costs. It's supposed to synergize with Suun's Loom, Atomic Library. Zero Spire, Coolant Injector is a less extreme version of Tempoquake, Cryostasis. Tempoquake, Cryostasis reduces ability cooldowns and weapon damage by 90%. This game-changing relic makes some of the faster damage abilities as fast as attack abilities. Combined with Zero Spire, Coolant Injector, it can reduce ability cooldowns by insane 95%. Still, its downside is massive and might require ridiculous amounts of weapon damage or ether generation to be useable. House of Hate, Isotope Equalizer might be the most powerful relic of the six added with this update. It doubles weapon damage, ability ether costs, and ability cooldowns. Because ability ether cost and cooldown modifiers do not affect attack, shield, and shield removal abilities, House of Hate gives you more than it takes away. This incredible relic increases the part limit by 10 and reduces core attributes - maximum armor, maximum ether, and weapon damage - by 25%. It also doesn't increase the weapon limit. 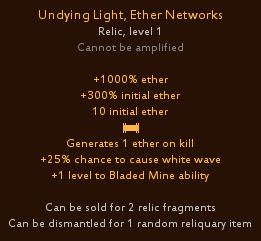 It's a simple, but useful relic - it generates ether amount equal to 5% of maximum ether when an enemy is destroyed. Attack abilities now release projectiles from all weapons. Projectiles released are based on weapons and attacks that released them. All weapons now have base weapon damage. Weapons now have more skins - they are unlocked every 10 levels until level 80. You can no longer use weapon damage amplifiers on sections and engines. Removed cooling rate and ether efficiency properties. Missile Strike ability has been renamed to Strike. Concentrated Fire ability has been renamed to Flurry. Spread Mines ability has been renamed to Unload. 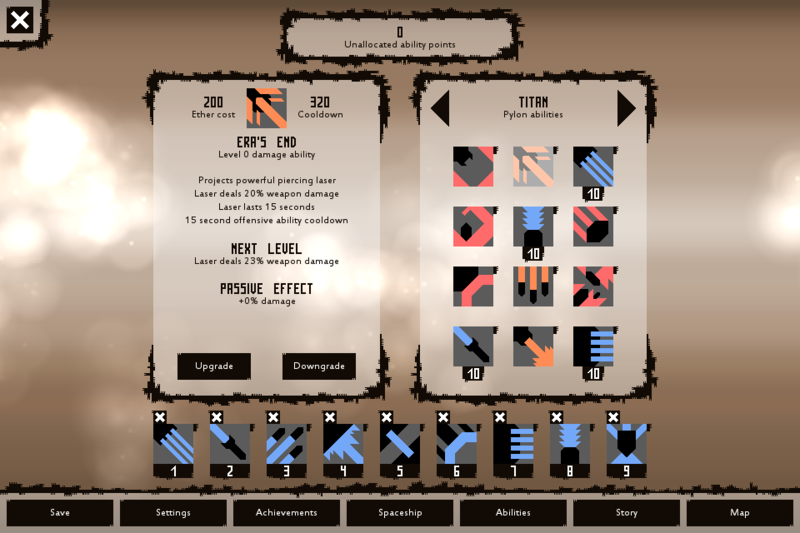 Time attack missions now support all modular difficulty system modifiers except The Decision and Hivind's Army. Different regions now spawn different minions for time attack missions. Instead of scaling reward, now you get +150% loot quality in the beginning of the mission, that decreases by 1% every second. Time attack missions now give standard rewards. Mythical parts now cost about 2 times more than fractal parts. Etalons now cost about 3 times more than fractal parts. Reduced amount of alloy received from dismantling mythical parts and etalons. Compressed parts no longer have higher prices than normal parts. Oesa's Radiance set effect nerfed: Now ether amount required to get a damage boost starts at 10 and increases by 10% every level. Etherion's Clash set effect nerfed: It only increases weapon damage by 120%, because installing different weapons no longer has a downside. You can now extract engine skins with cathodes. Changed how skins work: Engine skins can only be applied to engines, weapon skins - to weapons, and section skins - to sections. You can no longer use skins on installed parts. Slightly increased spaceship speed and acceleration. 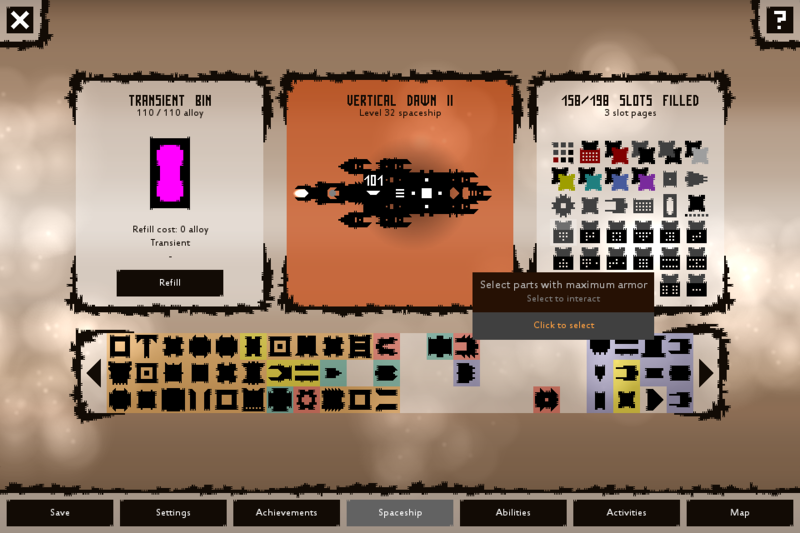 You can now check experience in spaceship building interface by going to spaceship stat page 5. Trism of Glory now increases weapon damage instead of cooling rate. Changed base ether cost of Piercing Laser ability to 5 and base cooldown to 45. Dropped parts are now picked up automatically if they are behind player's ship. Fixed: Game does not appear on the taskbar. Fixed: Mission 12 "Start mission" button in new game+ takes the player to a non-existent region. Fixed: Apex's lasers do not disappear when the apex is destroyed. Fixed: Black Rain ability effect remains active during story cutscenes. Fixed: Story spoiler: Broken Infinity level during mission 14 is wrong in the new game+. Fixed: Story spoiler: Mission 12 regions remain to be destroyed after the story is completed. Fixed: Achievement spoiler: Life rune spawns in Etender, Labyrinth, instead of Bloom. Fixed: Pyramids never appear in Broken Infinity. Fixed: Relic animation graphical glitch in start interface. Fixed: Relic level can go above level cap. Fixed: Volume bars doesn't work with a controller. Potentially fixed: Linux + language select problem. I have made changes to how controllers work with Sector Six and now the game should support more controllers. To fix new Restoration War glitches, old saves will generate new missions upon loading the game and will set contested region to region 25. Ether efficiency and cooling rate properties have been removed, so items will be updated to have weapon damage properties instead. Sections with weapon skins will have their skins changed to plating skin. Level 91+ relics will be scaled down to level 90. Recent discounts have increased player count by a lot of and I've got a lot of feedback. The development of this update has begun with proper sell all/dismantle all/uninstall all button confirmations. This should prevent accidental selling/dismantling of valuable items, and is possibly faster than previous system - no need to wait for "Cancel" time to run out. The next thing I did was a vendor rework. Clicking on a secured region instantly opens vendor interface, and the interface was merged with spaceship building interface - now it's possible to dismantle/install/uninstall/compare parts and alloy containers while trading. The other change is that now it's not possible to visit the same vendor again until you complete a mission. This was done because it would very easy to connect and disconnect to vendors to generate new stock for free - and the game needs that unit sink. Also, it makes having multiple secured regions with the same vendor type useful. Overall, I think it's a large improvement to the whole trading experience, and I can't wait to release it. Now I will be working on a new endgame activity - Absolute Deterioration. The feedback I got about this, suggests that players who make it to max level are so powerful, that no current content is challenging to them. Absolute Deterioration will change that. This endgame activity will have players to do an endless mission, in which enemies keep getting stronger. The current plan is to make enemies spawn every time there's no more of them left. E.g. : You destroy heavy and veteran spawn in its place immediately - there are no pauses, combat is constant. 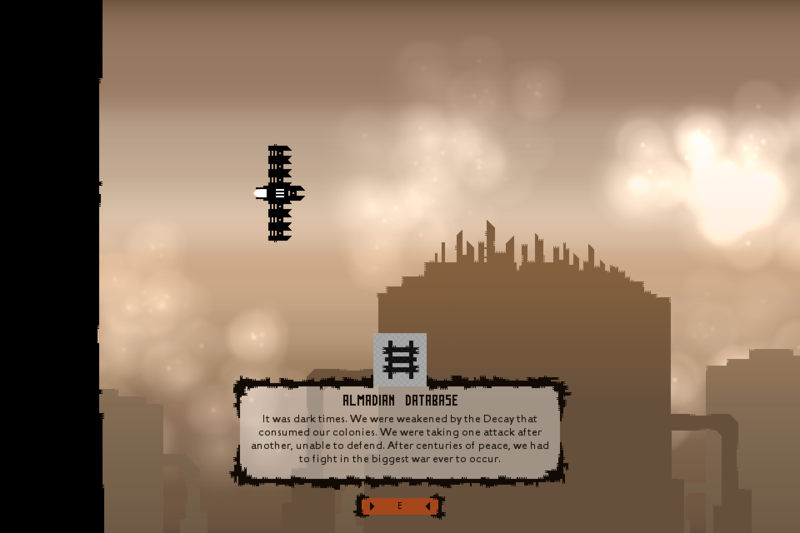 After you destroy a certain amount of enemy groups, a new wave begins and enemy power increases. This goes on forever until you are destroyed or extract. Not sure about how extracting will work right now, but probably you'll be able to press R anytime during the mission and it will end. The more waves you survive, the higher chance you'll have of getting one of Absolute Deterioration relics after you extract. There will be 6 Absolute Deterioration exclusive relics, with the possibility of more being added in future. After armor drops to 0, Core will give you 3 seconds to restore it, before spaceship is destroyed. 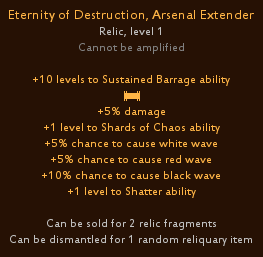 This relic will increase relic limit by 2, so +1 extra relic, besides itself. Flame Network will turn deflected enemy projectiles into seeking missiles that deal 100% weapon damage. This relic increases weapon damage based on how many projectiles there are on screen - making certain abilities stronger, and certain enemies weaker. This relic will allow you to have both Oesa's Radiance and Kithalia's Blight set effects active. -40% damage reduction, -10% armor from all minions in the mission. One more thing about Absolute Deterioration: To start it, you'll need to max out all difficulty modifiers. So yeah, that will be the most brutal content I ever created. Add language select button controller support. Make Flurry and Unload abilities benefit from Rapid Fire Mode ability. Add an option to "favorite" parts, making them impossible to sell. Reduce the time it takes to fail the mission. Reduce the time it takes to resurrect during resurrection missions. Make highlighting easier to use. Allow inverting LS with DPAD. Allow mouse binding for ability slots 1 and 2. Hope this looks good, until next time! This update adds much-needed challenge for players with really high power level spaceships, improved vendors, many quality of life changes based on player feedback, and important fixes. This is the end of your invincibility. All of the worst instances collapsed to form absolute deterioration. In this vortex of nightmare incarnations, your enemies will become more and more powerful, until your strongest weapons and best tactics are worthless. Until you have no choice but to flee or be destroyed. If you're lucky, you will escape with treasures born in twisted realities of deterioration. 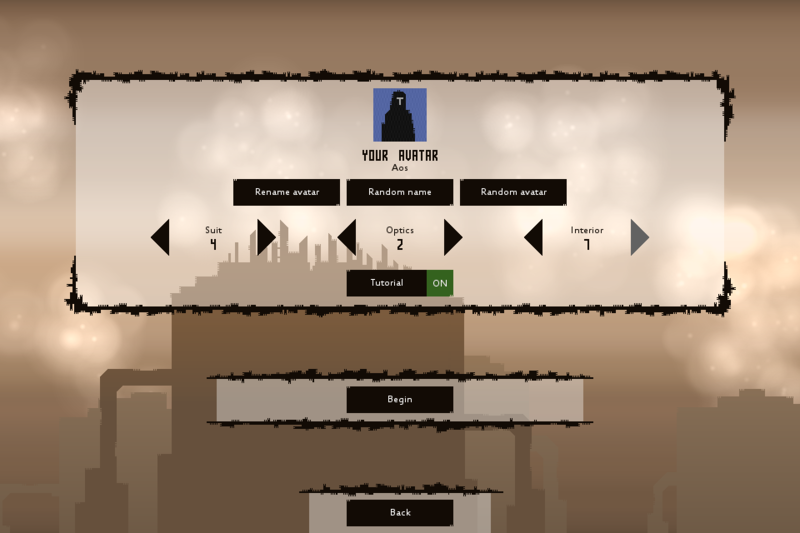 Absolute Deterioration is a mission in which you will have to fight waves of enemies. Enemies will enter your range as fast you destroy them, and with each wave, their power will increase. Fight as long as you can, then extract - the more waves you will defeat, the more decayed fragments you will get. This relic increases relic limit by 2. With this relic installed, projectiles your ship will deflect transform into seeking missiles that deal 100% weapon damage to enemies. This relic gives +1% weapon damage per three projectiles, meaning that you will deal more damage the more projectiles there are. This truly unique relic will allow you to have both Oesa's Radiance and Kithalia's Blight set effects active at the same time. Frailsphere will restore your armor 50% when it drops 0 once per a mission. Horrorcradle will become more powerful based on the highest number of waves survived in absolute deterioration. A recent breakthrough in quantum logistics have allowed improving long-distance part distribution systems: You no longer need to enter secured regions! This leap in technology has also led to the fusion of spaceship building and vendor interfaces: All building functions are now available during trading. Improved vendor interface and accessibility. Connecting/disconnecting to/from the vendor now is much faster. Now it's possible to uninstall/install/compare/dismantle parts and containers while connected to the vendor. Sell all/dismantle all/uninstall all/disconnect buttons now give proper confirmations. Vendors are now limited to one connection per mission completed. You can now lock/unlock items by moving the cursor over them and pressing L or - for controller users - Start. Locked items cannot be sold and dismantled. This ability will now increase deflect chance and deflect chance cap by 20% instead of giving total invincibility. It means that ships with 80% deflect chance will be boosted to having 100% deflect chance. The ability also no longer restores armor. This brings an end to Ultranid + Guardian exploit, but should still keep the ability relevant. Planars have been replaced with guillotines. Guillotines have improved versions of planar's attacks, and it activates shield later than planars used to, making them less annoying to fight. Moving cursor over filtered item now will make it visible. You can now filter/highlight/dismantle/uninstall/sell set components and parts with certain properties. Improved item selection in item management. Surge Accelerator, Exothermic Focus relic effect now works with Power Shield, Channel, and Creation of Energy abilities. Resurrection mission revenant phase now takes 10 seconds instead of 60. Black Rain shards now deal 25% weapon damage instead of 100% at max level. You no longer need advanced access to view sets, manage inventory, toggle map key, and jump to a region. Overload ability cooldown has been increased to 75 seconds to make it less exploitable. Gatherers and scions now stop shifting after firing 5 projectiles, instead of 10. Abilities 1, 2, and 3 can now be activated with the mouse: Ability 1 - left button, Ability 2 - right button, Ability 3 - middle button. Ancient container now gives 100 alloy when you pass dust cloud, making it more useful for certain mission types. Fixed: "Sell all" button sells crafting items. Fixed: Mass Detonate achievement description is wrong. Fixed: Level 13 region non-story mission crash. Fixed: Relic limit boost exploit. Fixed: Retrieval mission + The Rain of Fire problem. Fixed: Siege cannon ammo is not picked up when behind player's ship. Fixed: "Unbreakable" achievement doesn't work with apex and the Machines. Fixed: You can use alloy container during dialogues and cutscenes. Fixed: Average difficulty in Broken Infinity is not saved. Fixed: Cathode stacks disappear when using cathodes in vendor interface. Fixed: Black Rain shards hit the player with full weapon damage during shield duration end animation. Fixed: Mission II sequence break glitch. Fixed: Malasmar's damage zones deal no damage. Fixed: Risk For Reward + loot box graphical glitch. Fixed: Several grammar and spelling errors. 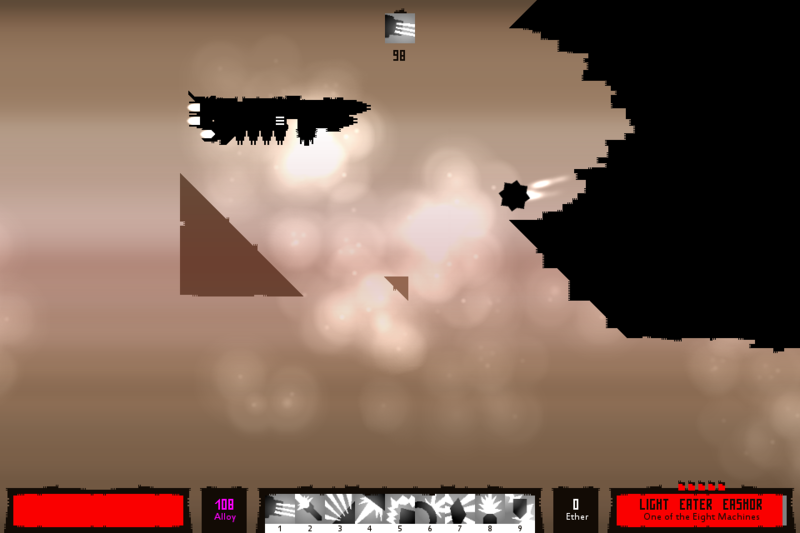 Fixed: Crash occurs in Broken Infinity after failing a mission. Fixed: You can get negative loot quality during time attack missions. This one deserves to be mentioned separately. Ever since it has been added, Restoration War activity have been glitched. The mission 12 regions fail to update for some reason, and it makes Restoration War reward impossible to get. I've tried to fix it with every update post-launch, but it's still here. So, I got really tired of fixing this glitch, and this time I'll use brute force to fix it - no matter what, mission 12 regions will not be stuck in their post-mission 12 states. Like last several updates, the regions will be restored upon loading the old version saves, and it shouldn't occur for the new players, so this should be the last time I mention mission 12 region glitch. It's now possible to choose Chinese and German languages - the game isn't fully translated to these languages, this is just for testing purposes. Make some changes to the code for localization features, such as different fonts for different languages. Now you can use the controller to select the language in language select screen. ZeroAfflex, Karodde, Ayalan, and Winterchild - thank you for your feedback and welcome to the credits! It's time for me to end Sector Six content development. For the last several months I've been switching between working on Sector Six and Light of the Locked World. I love both of the games, but I want to dedicate all of my time to LOTLW, and I can't do much to Sector Six to make it better. What I can do, I'll try to do with the final update. The most wanted Sector Six feature! It will make it possible to sort items by grade, type, properties, etc. - every option that works with the current filtering system will work with item sorting. Final Ascension will be an endgame activity that gives maxed players something to work on. Experience received after reaching level 90 will be used to increase the Ascension level. Increasing Ascension level will reward players with random skins from new skin set. Ascension level will also be a requirement to install altered parts. Altered parts will let me add meaningful, scaling item rewards and level 90+ parts without having to increase the level cap. After the update, all parts will receive a chance to become altered as they are generated. 2. The code is run to check if the part should be altered or not. 3. If it is, it gains 1 alteration level. 4. The code is run to check if the part should be altered further. 5. If it is, the alteration level increases by 1. Step 4 and 5 are repeated until one of the checks fail. It means that high alteration level parts will be much rarer than lower alteration level parts. Alteration level will improve part's properties. Increases maximum armor by (part level * 250). Increases maximum armor by ((part level + alteration level) * 250). Altered parts will also receive additional property. High-level altered parts will require Ascension level to be installed. E.g. : Level 90, alteration level 9 part will require Ascension level 9 to be installed. You will be able to spend alloy to make Broken Infinity instances as hard as Absolute Deterioration. Altered instances will have an increased chance to get altered parts. Reach level 90 and get all achievements to unlock the introduction to Sector Six's sequel, Sector Zero. Like with every update, the game will receive a lot of improvements - including increased mission failing time, new part highlighting, evolution mechanic improvements, and old glitch fixes. I intend to end Sector Six development with 0 known glitches remaining. In conclusion, this will be a big update! To clarify, this is the end of new content and reworks development only - support updates to fix glitches will continue. Hope all looks good, until next time! 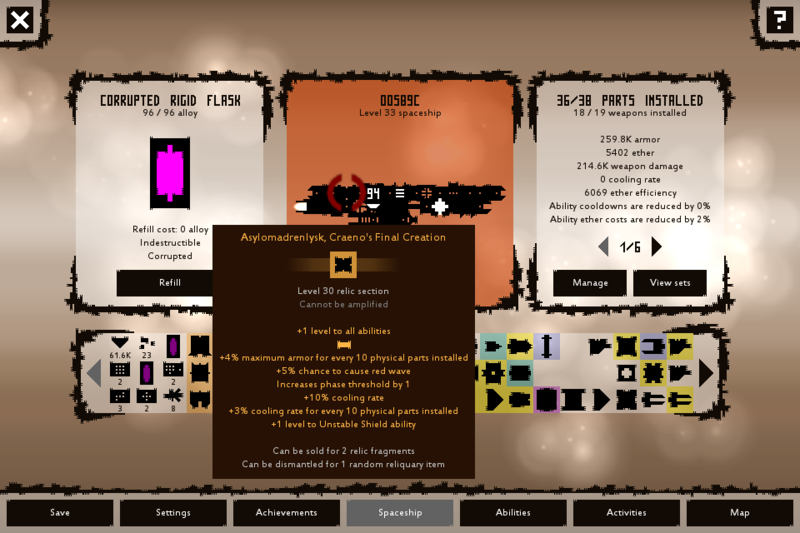 The last content update: Altered parts, Final Ascension, item sorting, and more! Here it is, the last Sector Six content update! Level 90+ or altered parts are here! Altered parts get additional property and their properties scale based on alteration level. 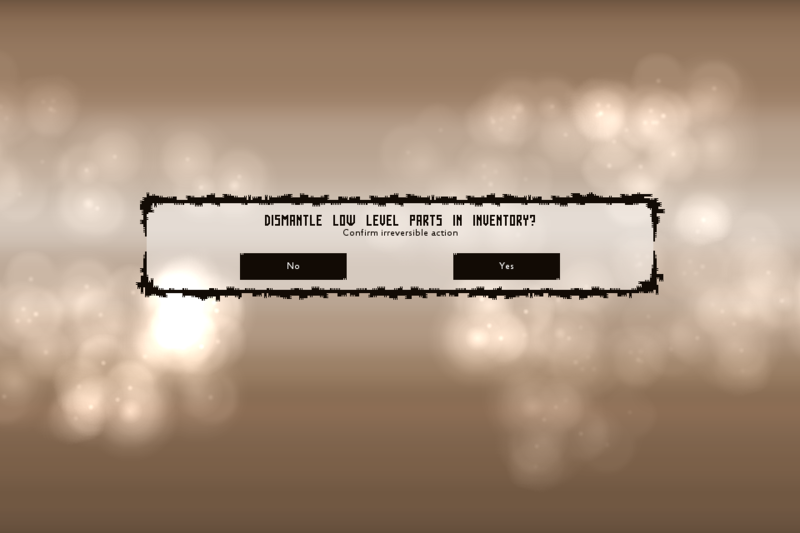 For example, level 90 altered part with alteration level 10 will have properties like level 100 part. Altered parts start to drop after completing the story. Highest level altered parts require Ascension level, which can be increased by spending XP after reaching level 90. Also, Ascension level increases the amount of Ascension Reactor's amplifier slots. 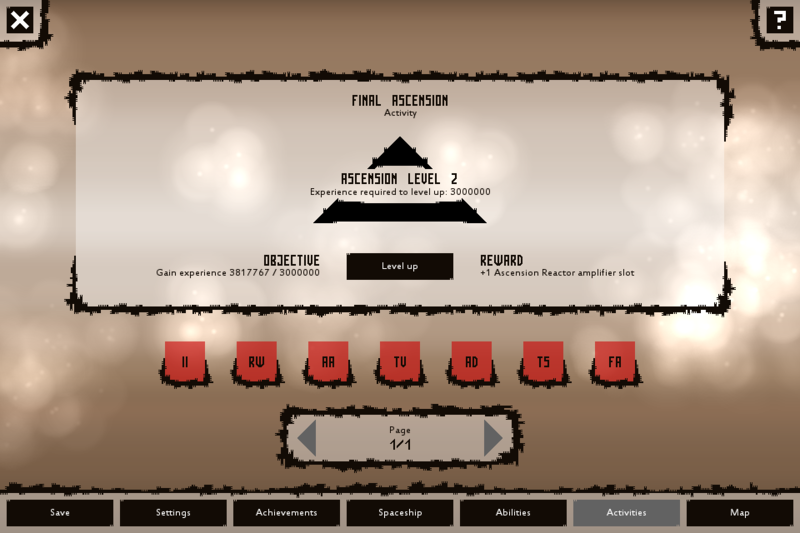 Ascension Reactor is added upon reaching Ascension level 1. Make Broken Infinity instances as difficult as Absolute Deterioration for an increased chance to get altered parts! Get all achievements, install an altered part, clear altered instance, and increase Ascension level to unlock an introduction to Sector Six's sequel, Sector Zero. The most wanted Sector Six feature is here! You can now sort items by grade, properties, type and other options - similar to how "Dismantle all"/"Uninstall all"/"Sell all" functions work! Connect to a vendor to set up automatic selling! While it's enabled, dropped parts of the selected grade range will be turned into units. Multiple quality of life, graphical, and control improvements. Help interface button now glows until it's clicked. Updated some data interface entries and added new entries. Replaced grade names - generic, optimized, advanced, fractal, mythical, etalon - with grade numbers - grade 1, grade 2, grade 3, etc. Original grade names can still be seen in tooltips, elsewhere the game uses grade numbers. This was done to make grades less confusing. For example, instead of saying "Mission reward: Optimized part" the game will now say "Mission reward: Grade 2 part". Failing a mission is now a lot faster. Rapid Fire Mode now speeds up all attack abilities. Evolution mechanic improved: Minions now evolve into bigger minions faster. Added level 90 weapon skins. Achievement spoiler: Symbol of Life and Cache achievements can now be achieved in Broken Infinity. Made several improvements to language selection systems. Changed item tooltip system: Tooltips will no longer go outside the screen. Ability interface now shows ether cost clarification if Flow Stagnation modifier is enabled. Dismantle all button moved to vendor interface to make space for sort button. New parts are now highlighted and can be interacted with through management: Uninstalled, dismantled, sold, filtered, and sorted. Added flipped versions of a station, deflector, inhibitor, and antenna skins. Item experience boost is now capped at 200%. NA-1, Naonic Archive increases the cap to 300%. Power Shield ability now attempts to cause white wave when activated. Level parts 89 are no longer generated in level 90 missions and vendors. Weapons are now slightly more common. Weapons are even more common in regions 1-4 to help the new players get enough weapon damage. Frailsphere, Pearl of Deterioration no longer halves maximum armor. Legionvault, Fractal Arsenal now also increases double drop chance. It's no longer possible to create level 90+ instance. Increasing difficulty now gives +5% loot quality and +1% double drop chance per difficulty level instead of 10% and 2%. Lodeon's Ultimatum set effect now scales with the number of parts installed: Armor to damage conversion reaches 100% with 80 parts installed. Relics can now be sold for units! For technical reasons it's no longer possible to use anodes on Upgrade Sockets, Amplifier Well relic. Fixed: Instance loot quality does not work. Fixed: Elimination mission objective reminder mentions escorting the carrier. Fixed: Vendor items in Broken Infinity are affected by instance loot quality. Fixed: Scrambler Belt Escalation achievement description spelling mistake. Fixed: Locked parts cannot be uninstalled via uninstall button. Fixed: Crippled Vault relic is preventing level ups from increasing the part limit. Fixed: Area tooltip + The Decision modifier problem. Fixed: Level 75 level up screen does not show that part and weapon limit has increased. Fixed: Story spoiler: Infinity is called Broken Infinity before it's broken during mission 13. Fixed: Mission 12 cannot be completed. Fixed: Minor alloy container issues. Fixed: Mistake in Fear Bringer Ourend's minion spawning code makes enemies jump forward after been spawned causing all sorts of problems. Fixed: Sections are generated with weapon skins. Fixed: Non-rotating skins + rotated parts + skin applying problem. Fixed: Re-stock button tooltip is visible outside vendor interface. Fixed: Controller cursor doesn't stick to the spaceship building grid in vendor interface. Fixed: Wrong level 80 node skin. Fixed: Map arrow button controlled hint. Fixed: Restoration War may select already secured region to be contested. Fixed: Minor resurrection mission glitch. Fixed: Sell all result notification shows the wrong unit amount. Fixed: Minor selling particle effect glitch. Fixed: Guillotine + seeking projectiles problem. 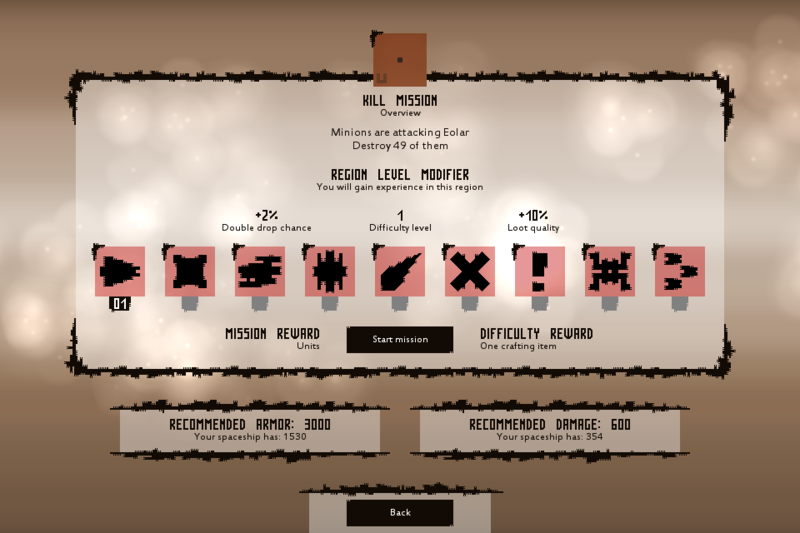 Fixed: Pearl of Deterioration effect triggers Sacrifice achievement. Fixed: Contribution and vendor statuses are not updated when new missions or instances are generated. Old saves will be updated to fix saves affected by mission 12, Restoration War, and Crippled Vault glitches. Nothing much besides localization updates (Coming soon: Brazilian Portuguese!) and glitch fixes - if they will be needed. It took me 4 years to get Sector Six to this point and well... I did it! I made a game, I made some money, I've become a real game developer, saw players having fun, got positive reviews, the future is promising, all is great! BaBiA Game Studio likes this.